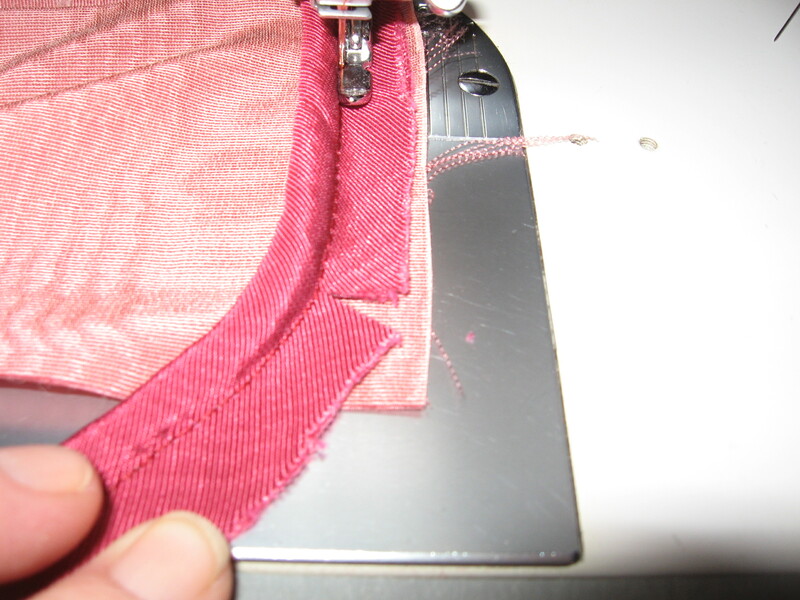 As it is with InSewVation, you get a burst and forget to take pics. 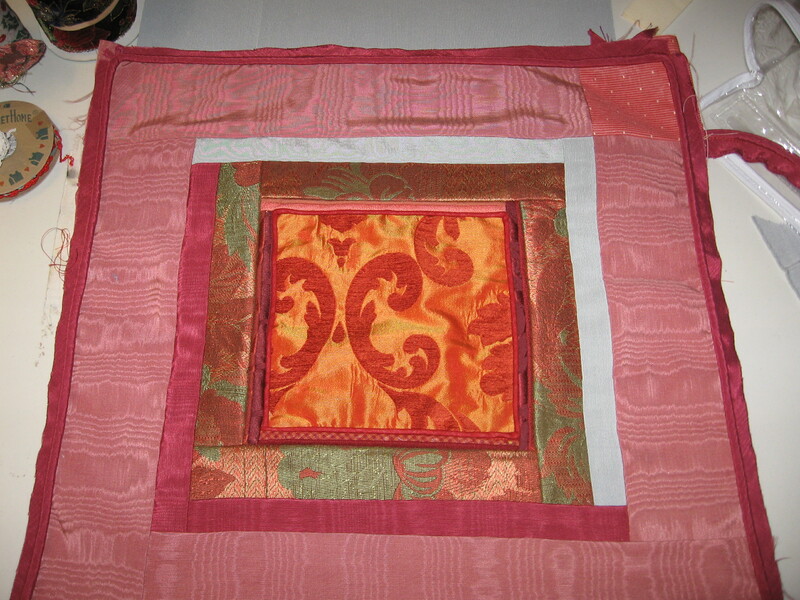 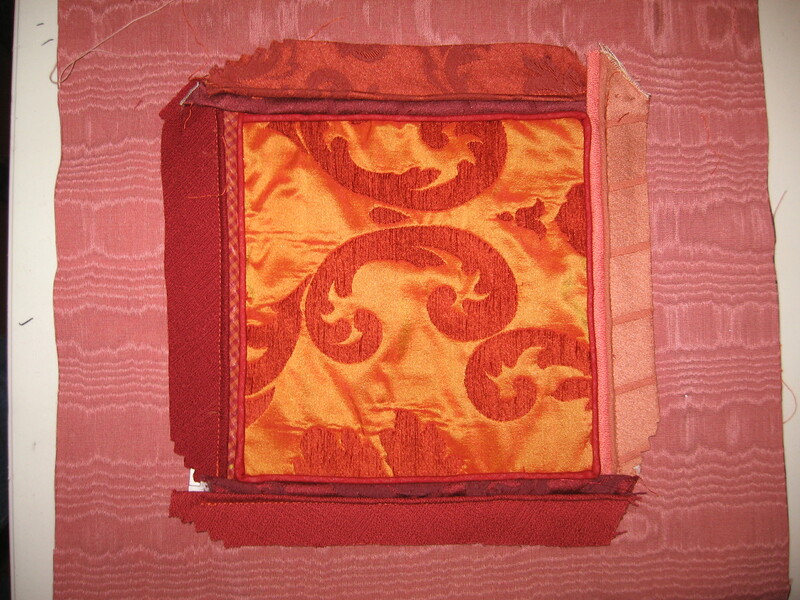 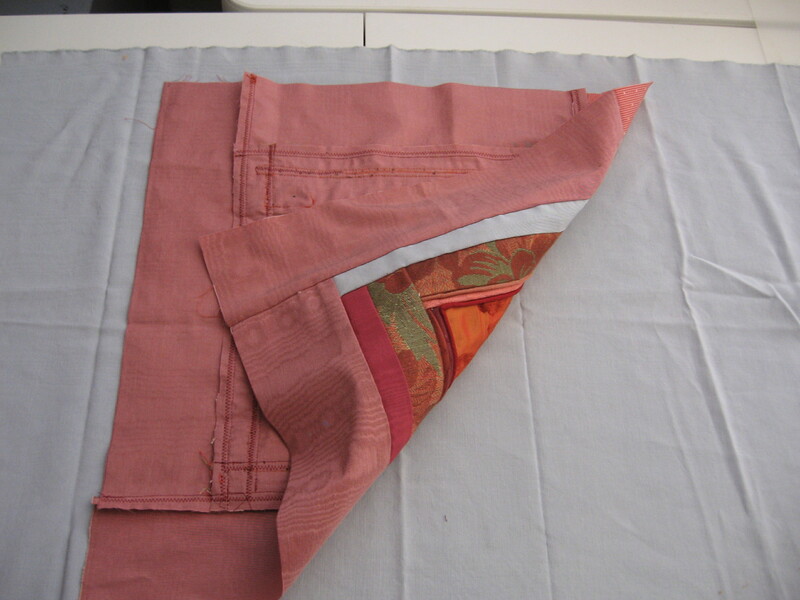 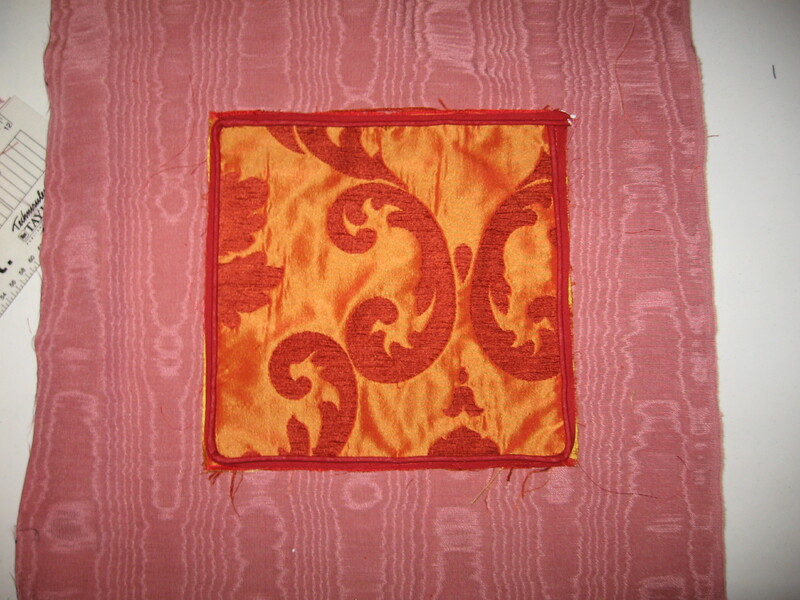 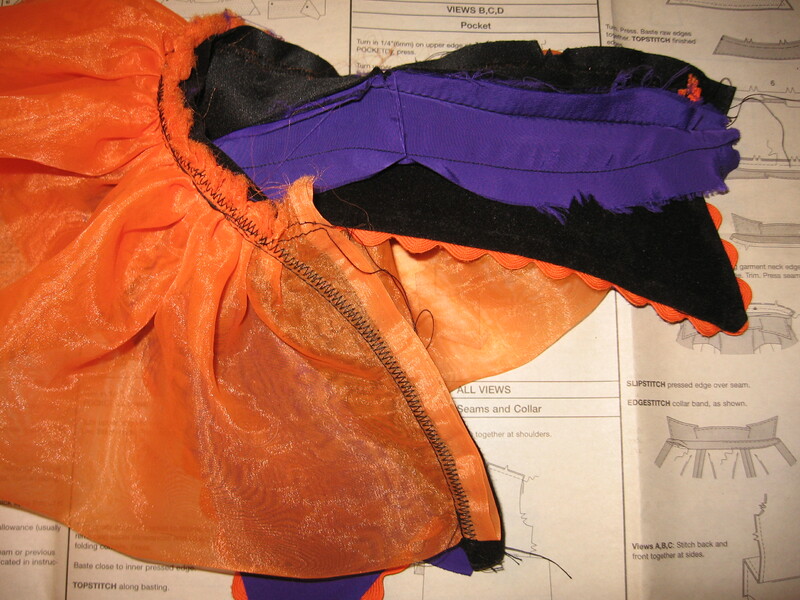 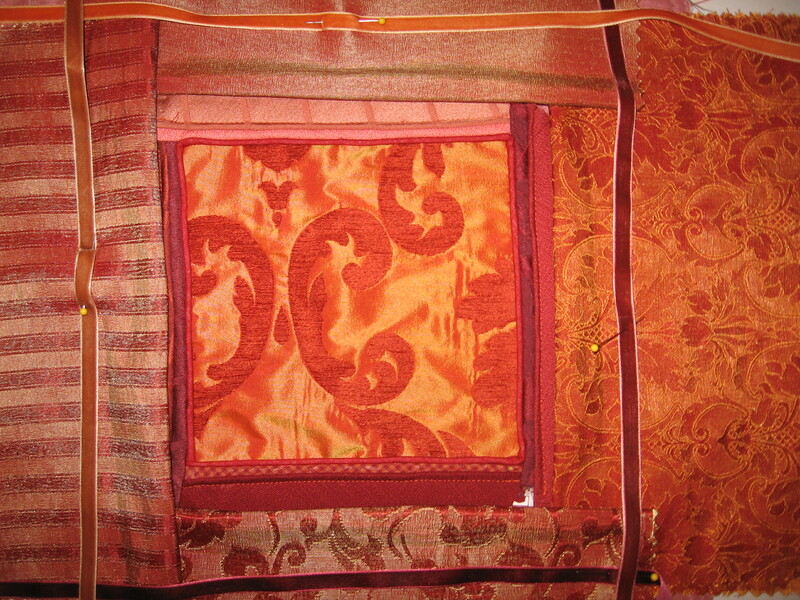 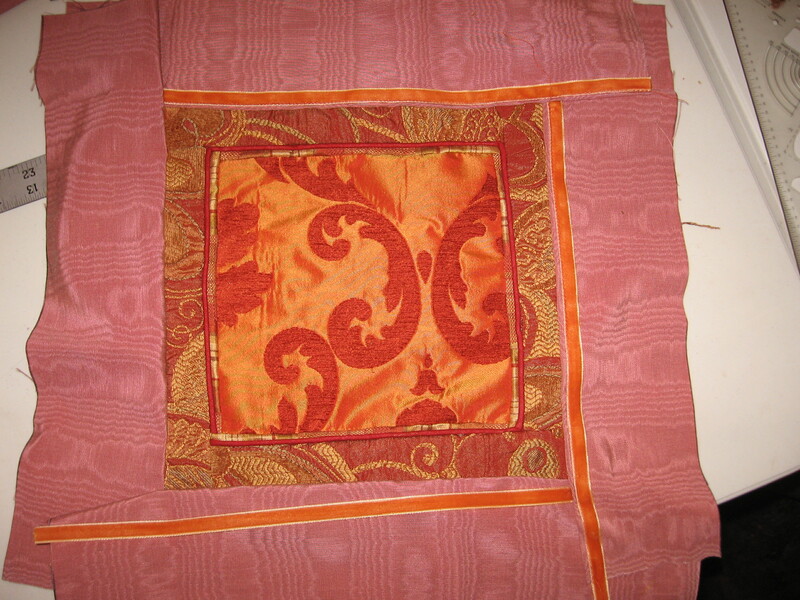 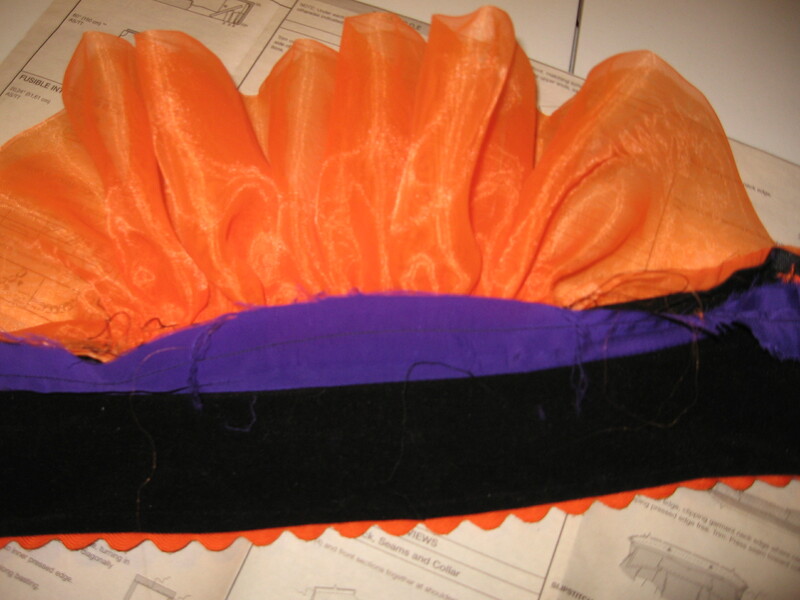 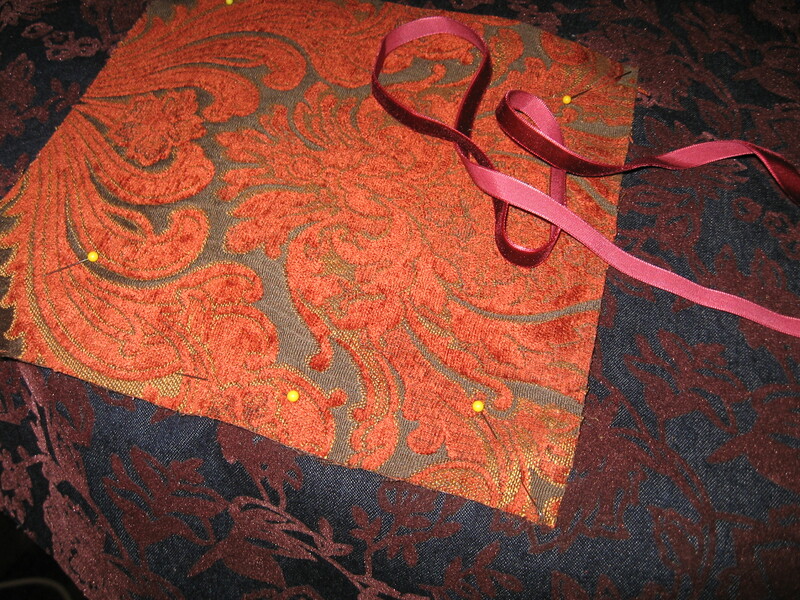 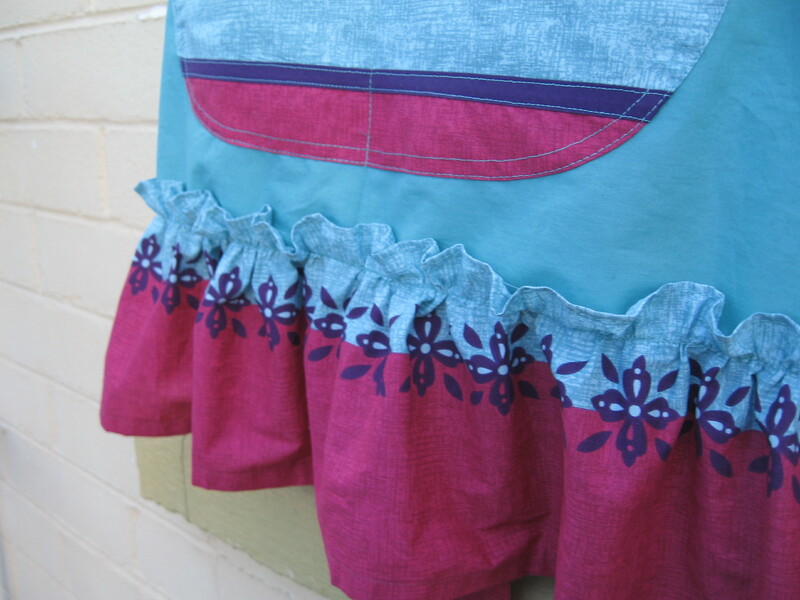 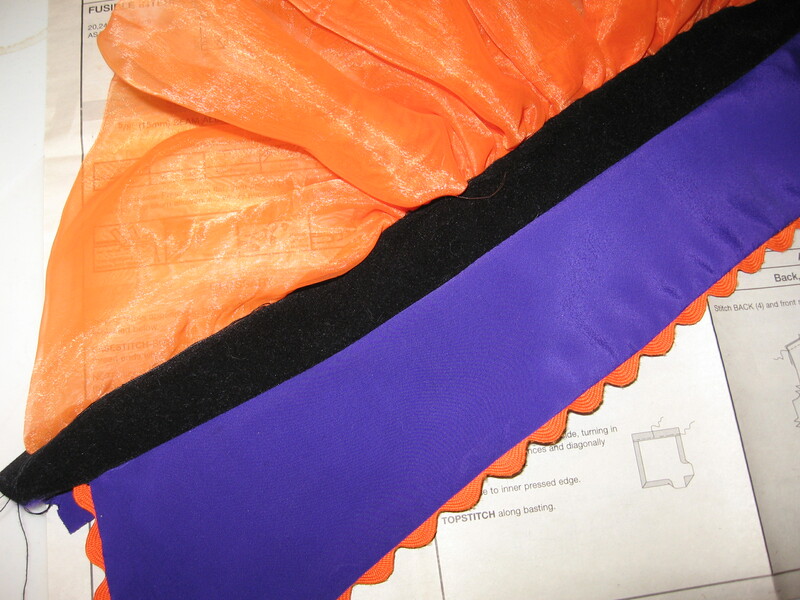 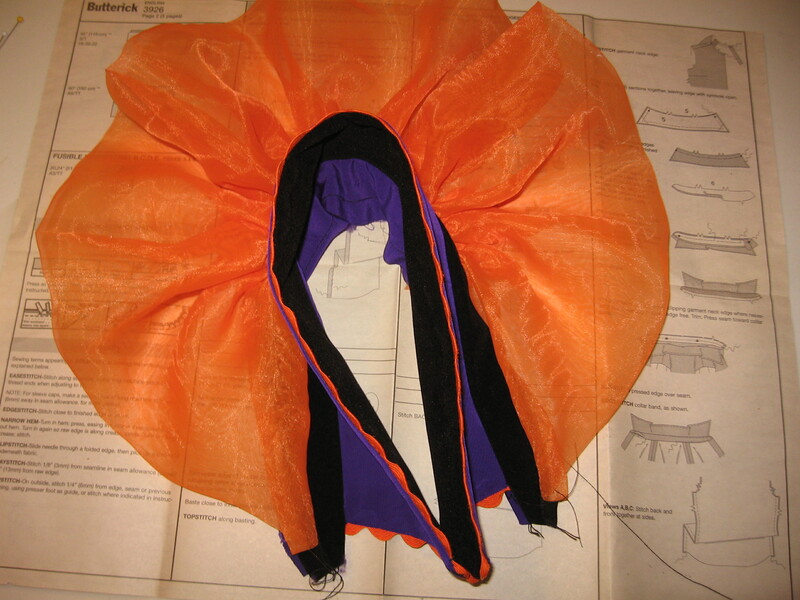 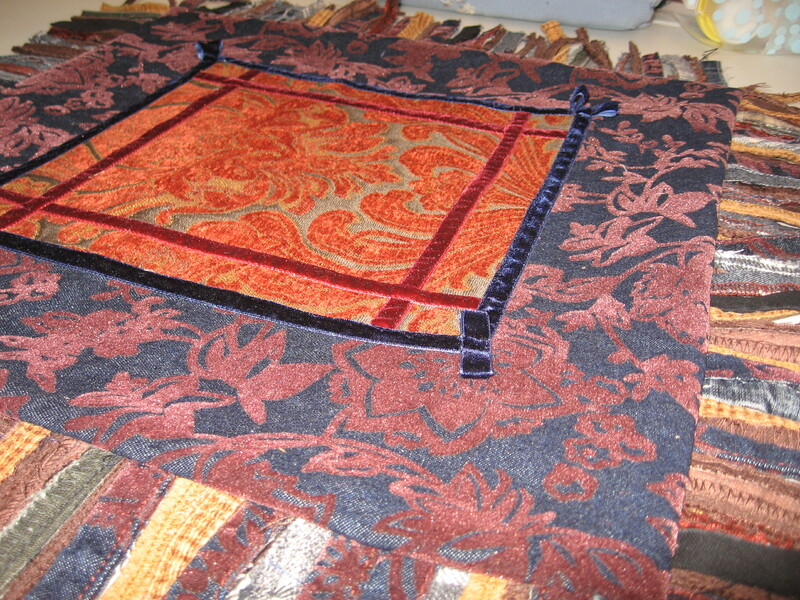 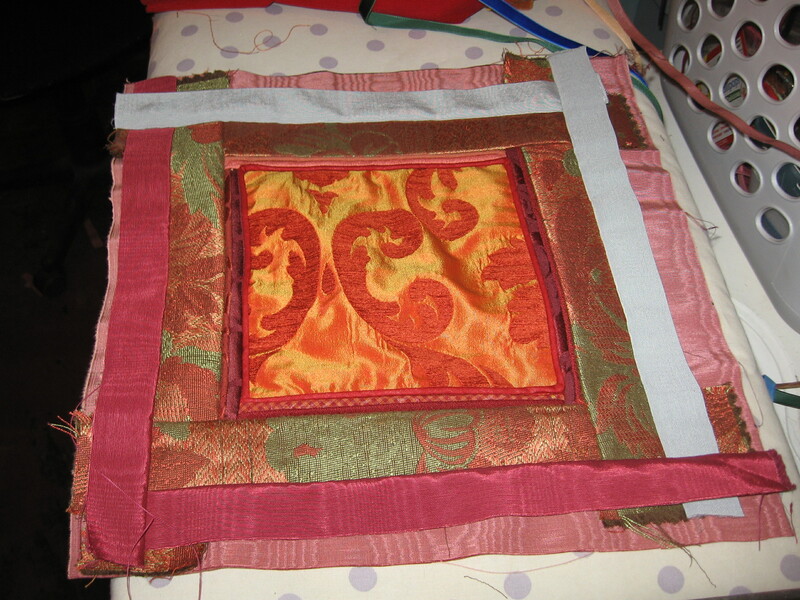 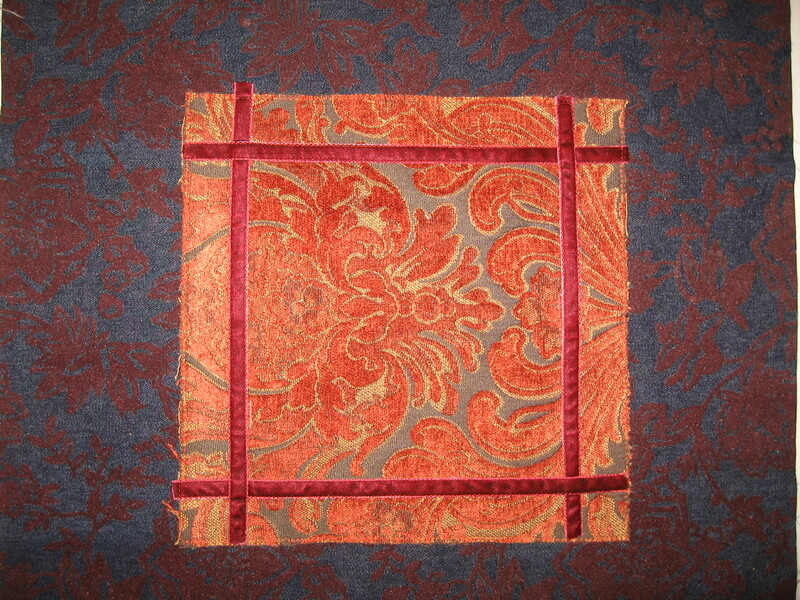 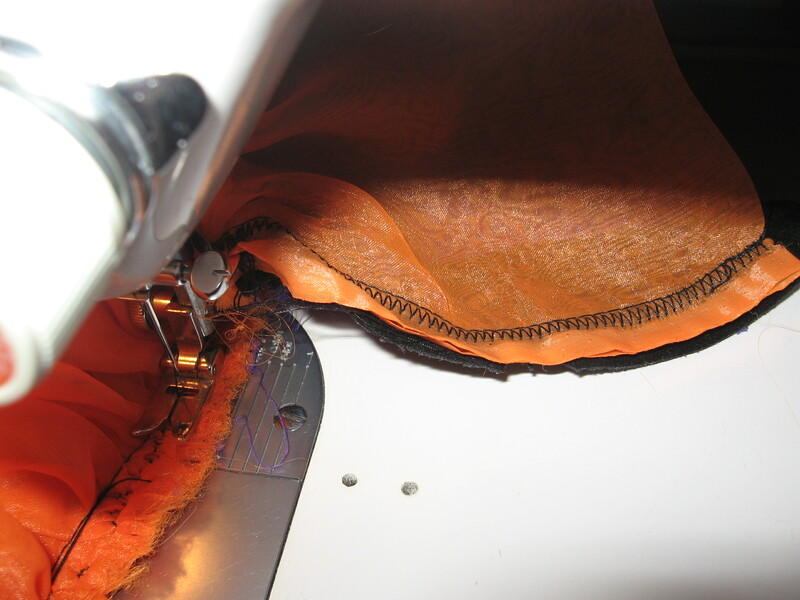 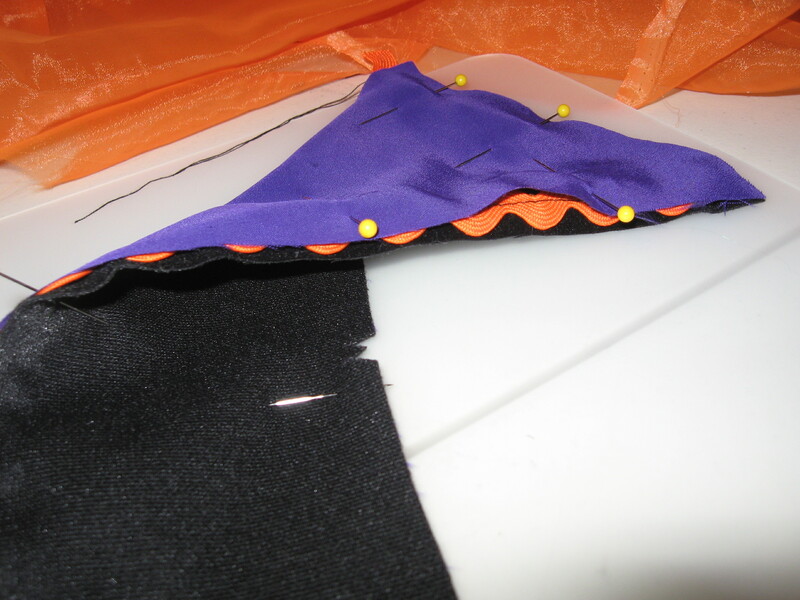 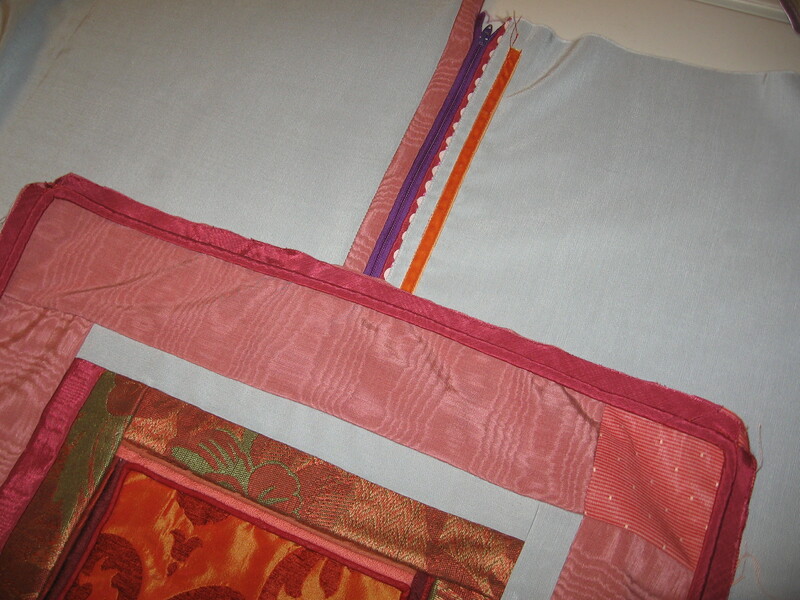 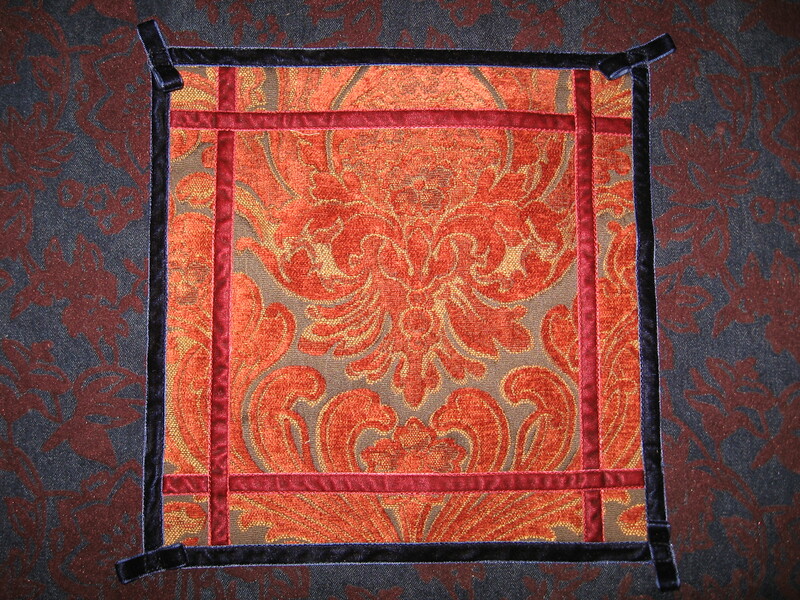 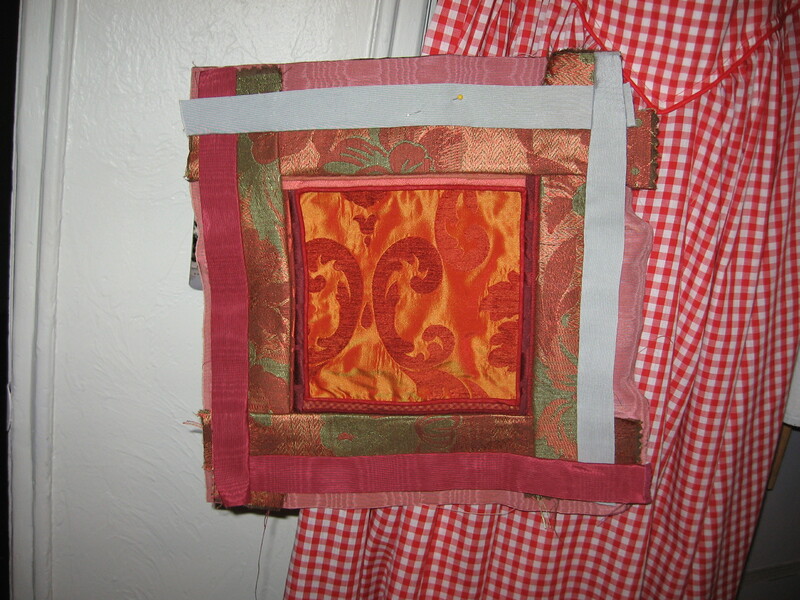 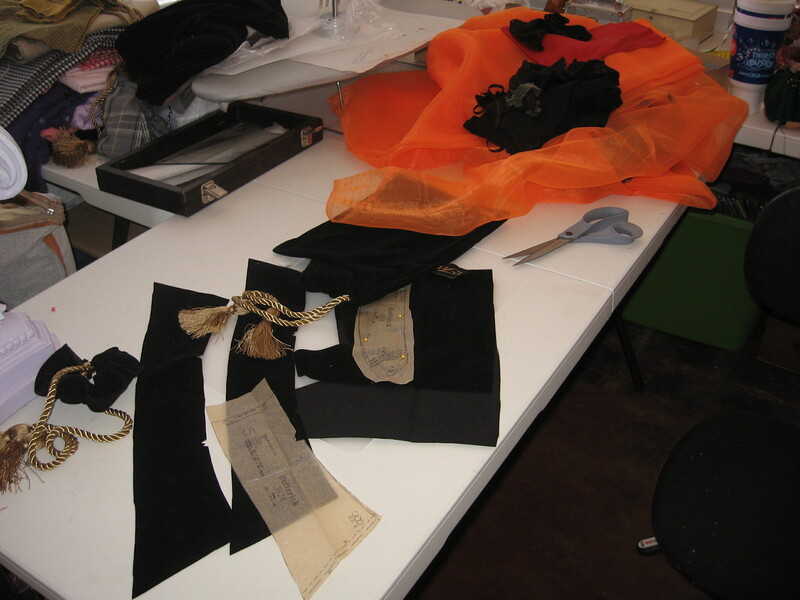 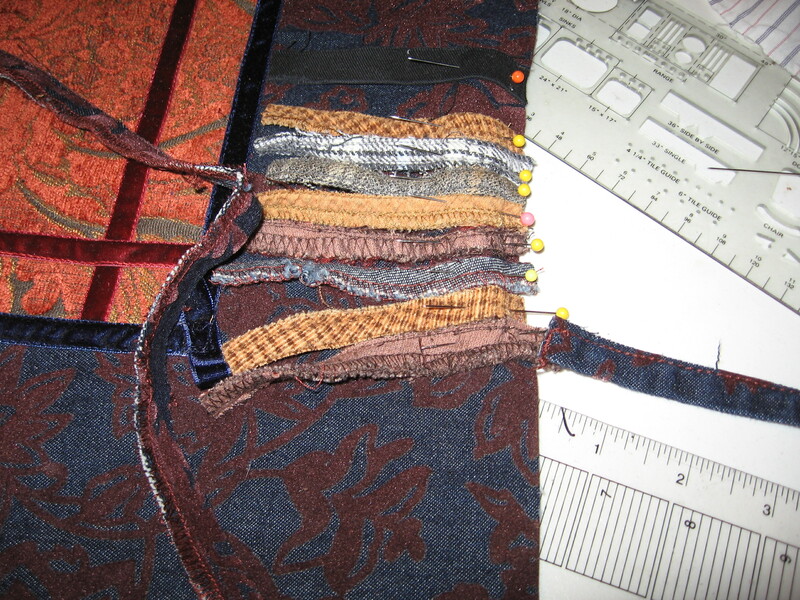 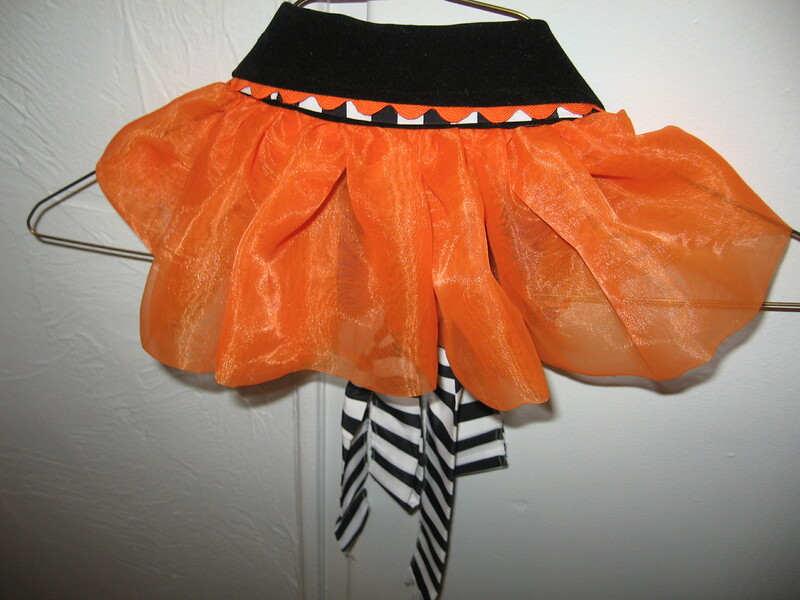 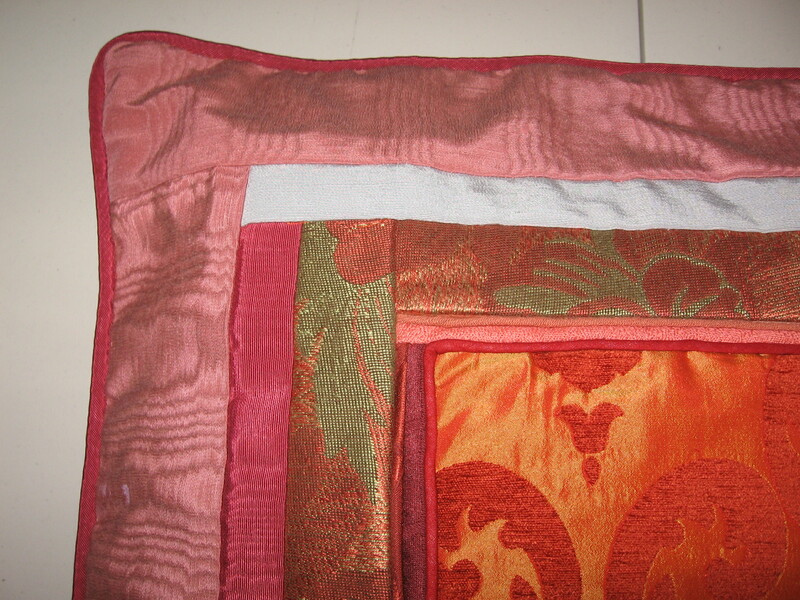 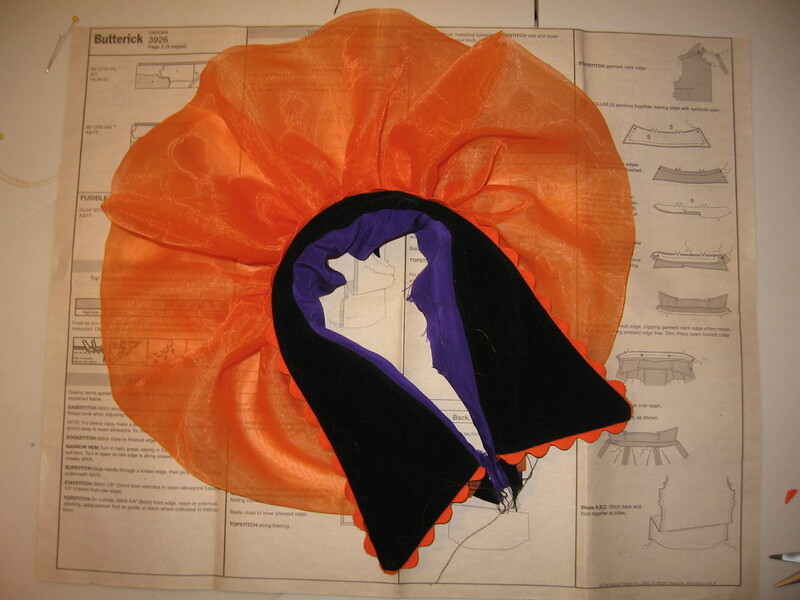 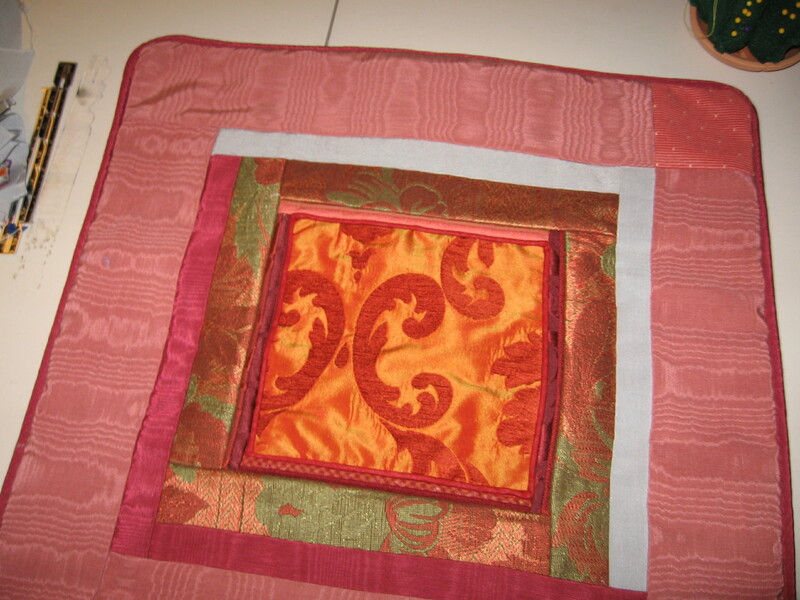 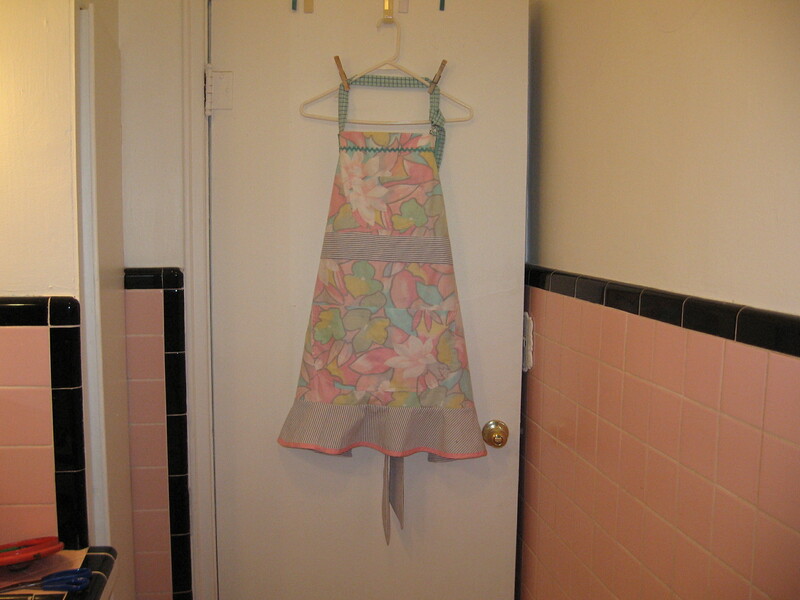 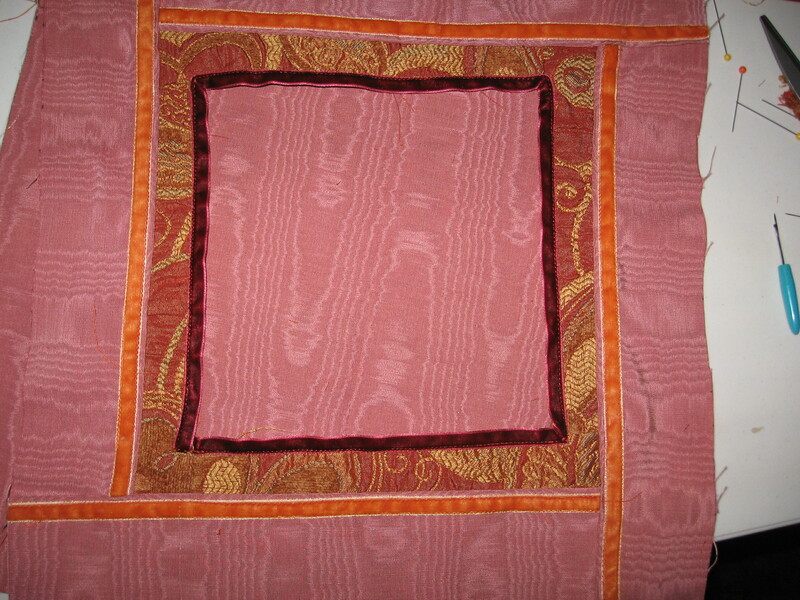 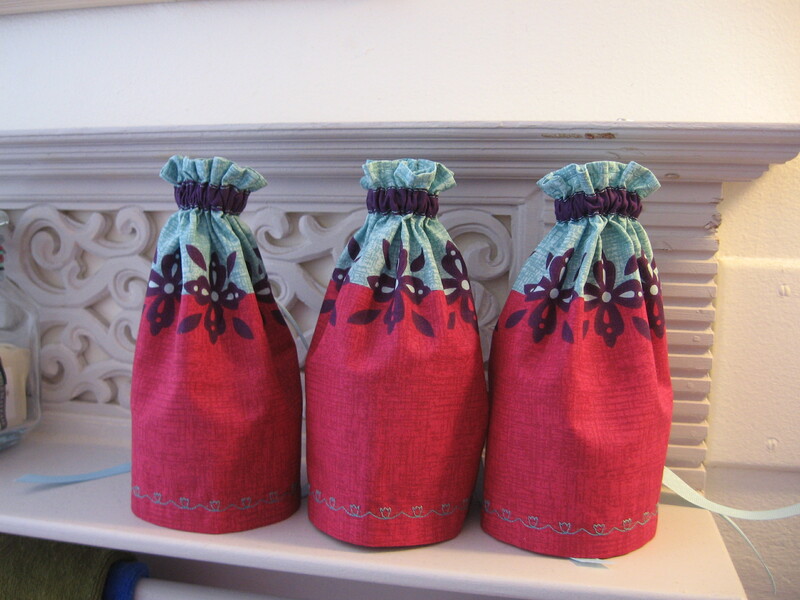 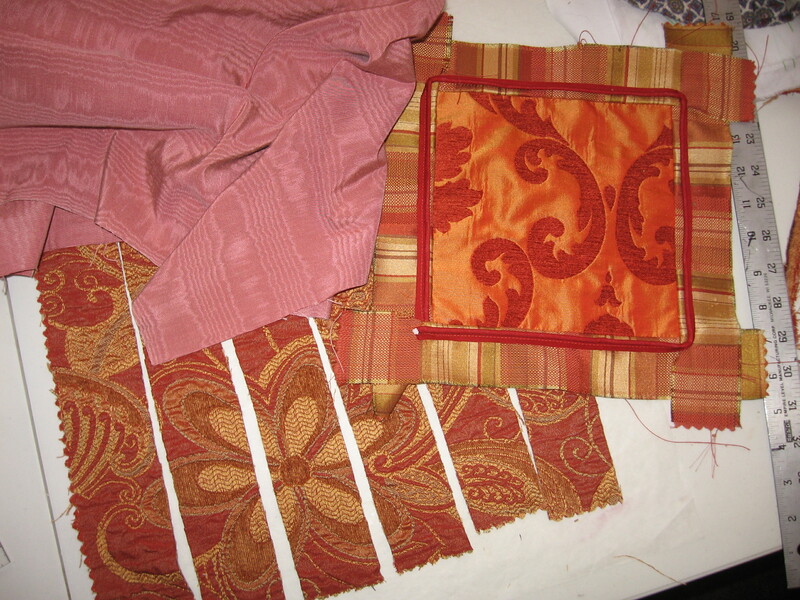 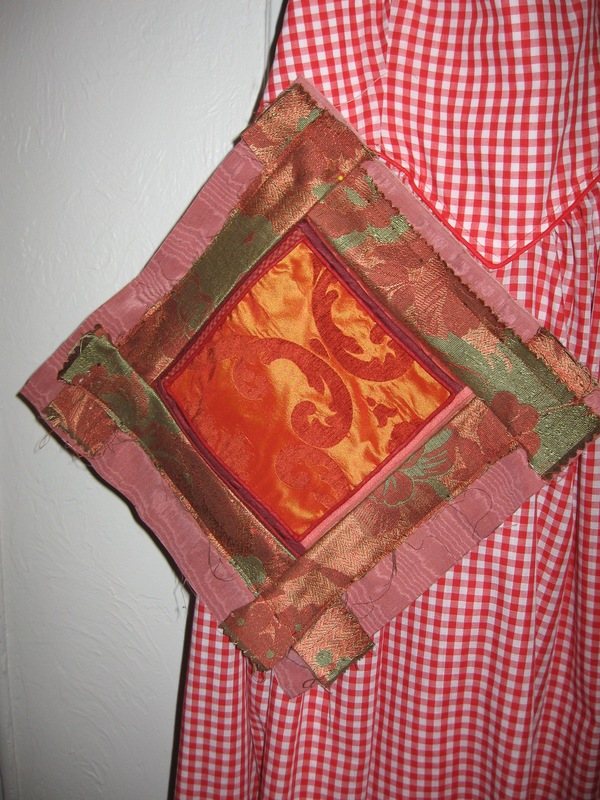 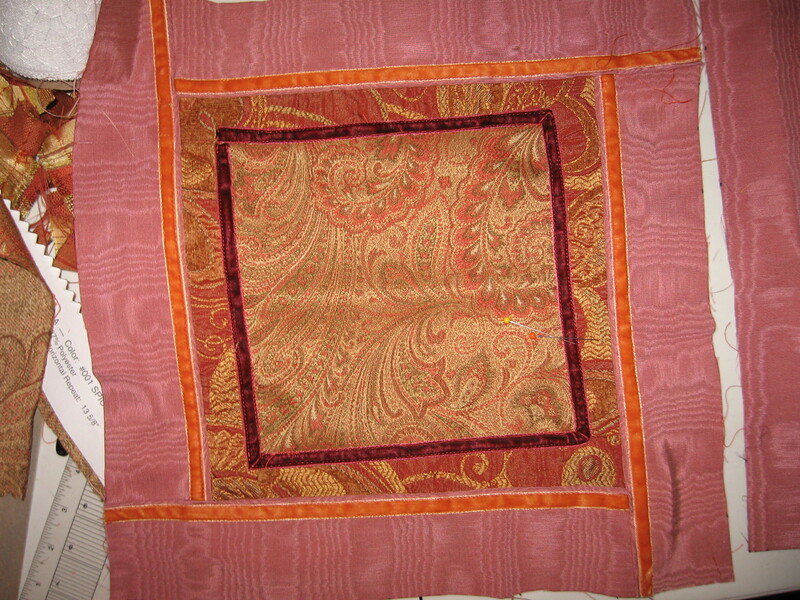 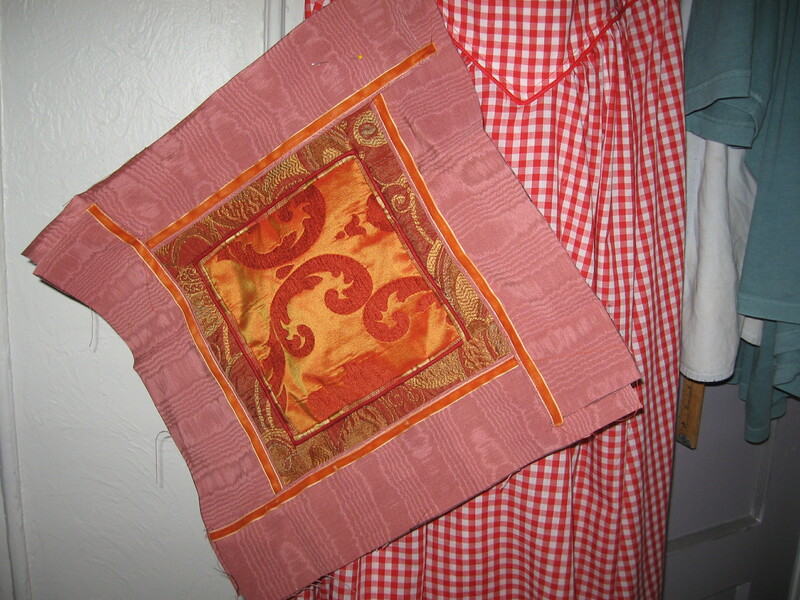 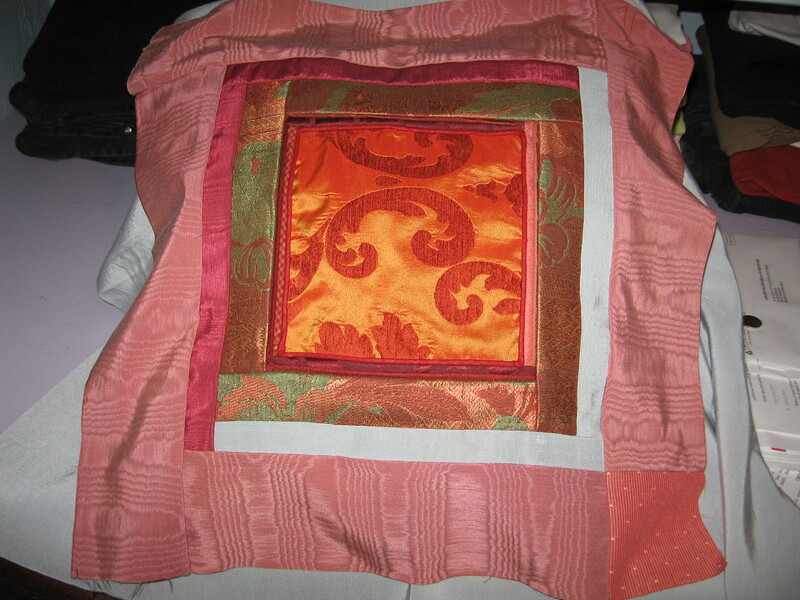 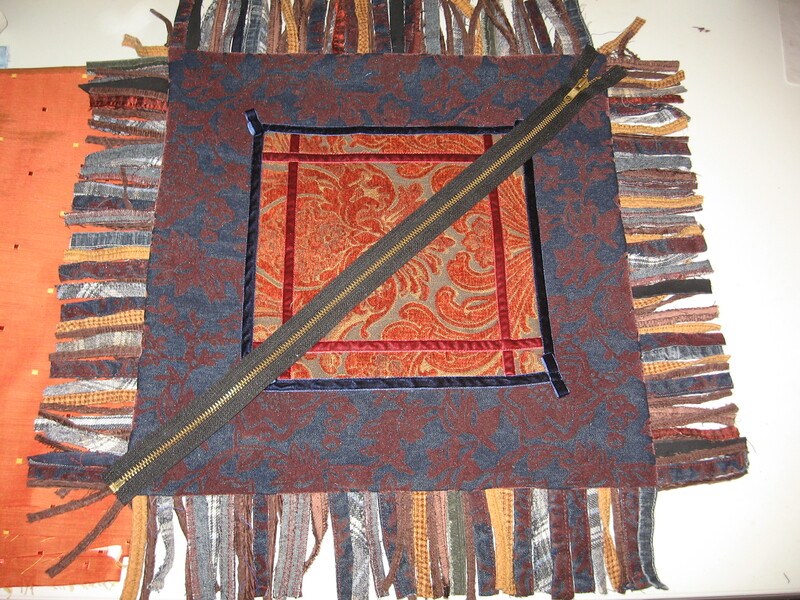 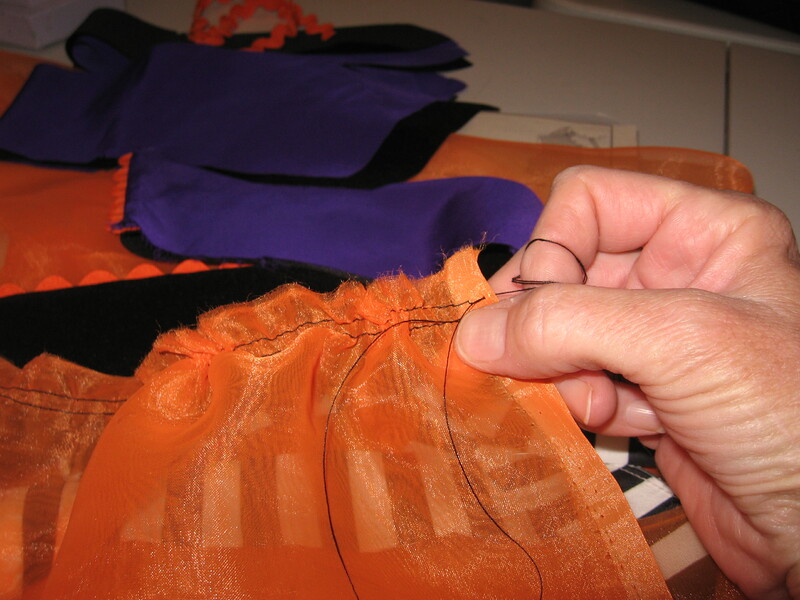 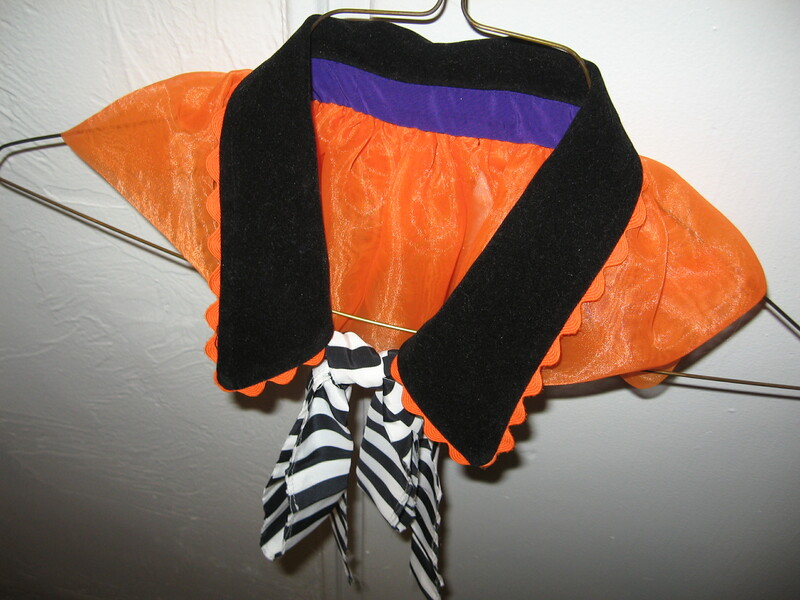 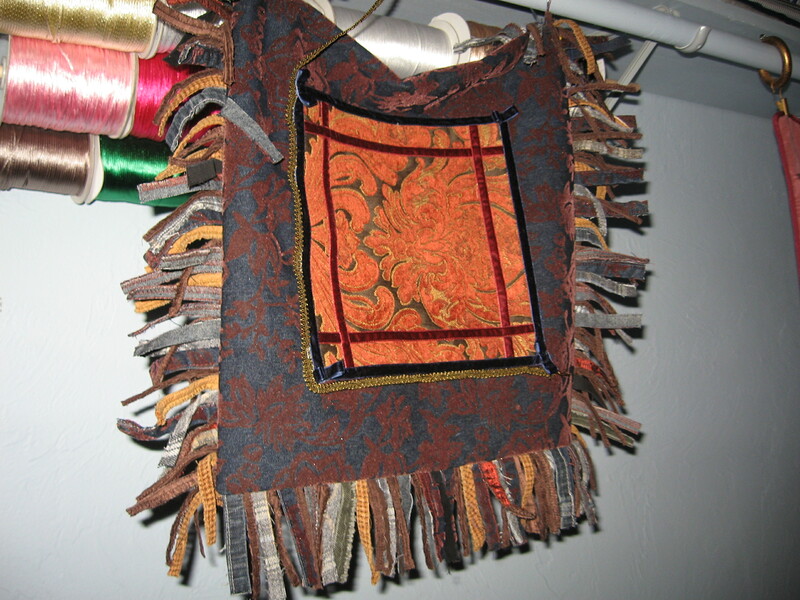 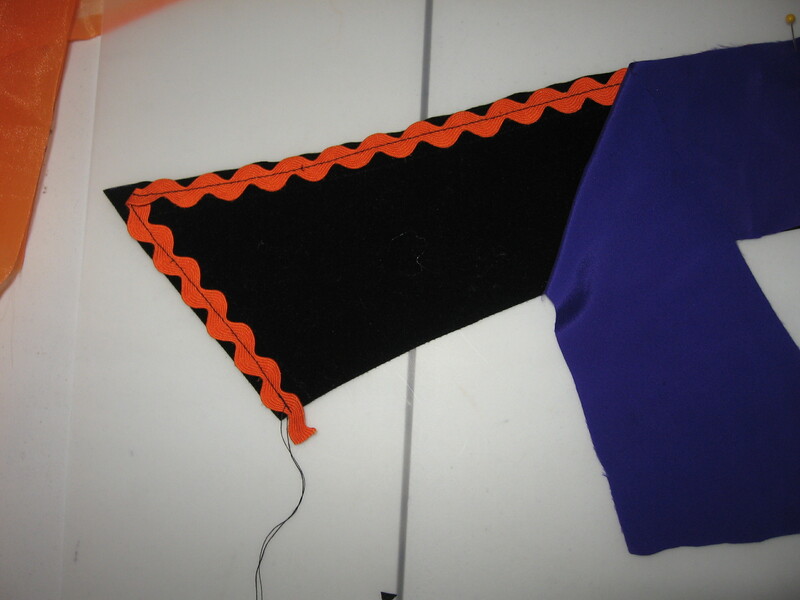 The orange and rust designer damask center fabric is what got her started. 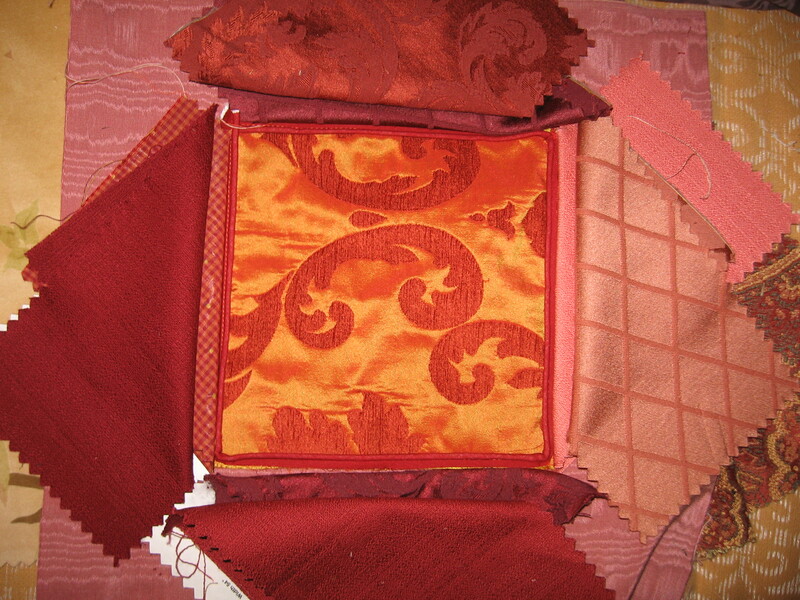 One of her fabric reps had donated a sample book of exclusive damask patterns good for use with drapery, bedding, upholstery. 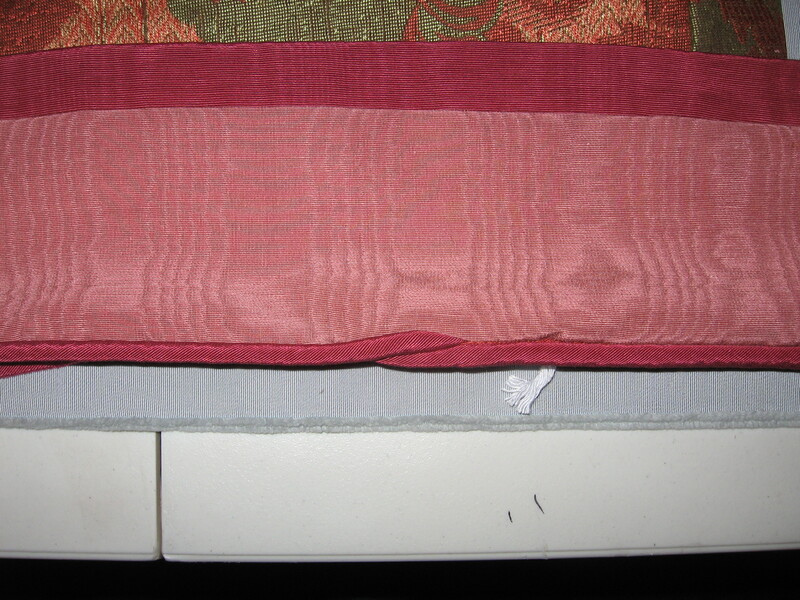 While she had Lollipop & Polka Dots Variety Store, she had had the fabric book out as a feature display; but when anyone learned of the $65 p/yard price, there was a fainting sigh. 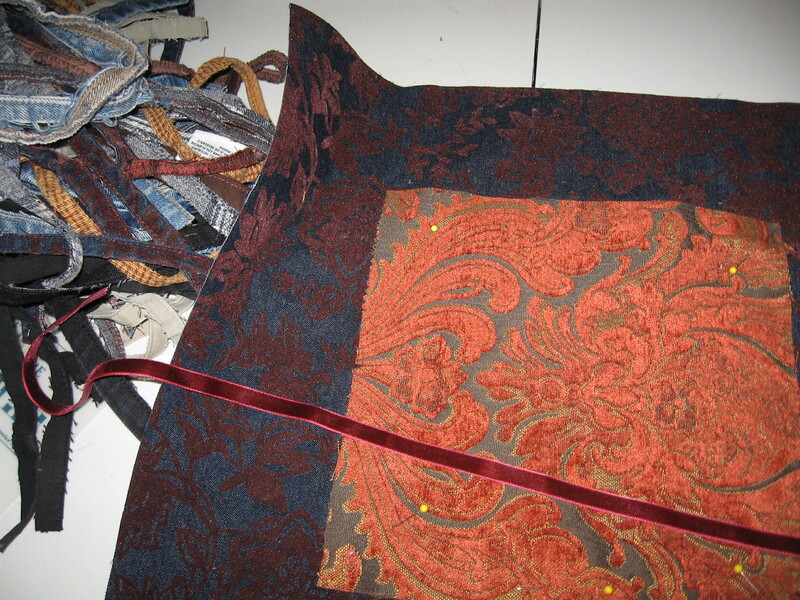 So, Ms. SpoolTeacher decided she would relegate the book to her resoures pile and attend to it later. 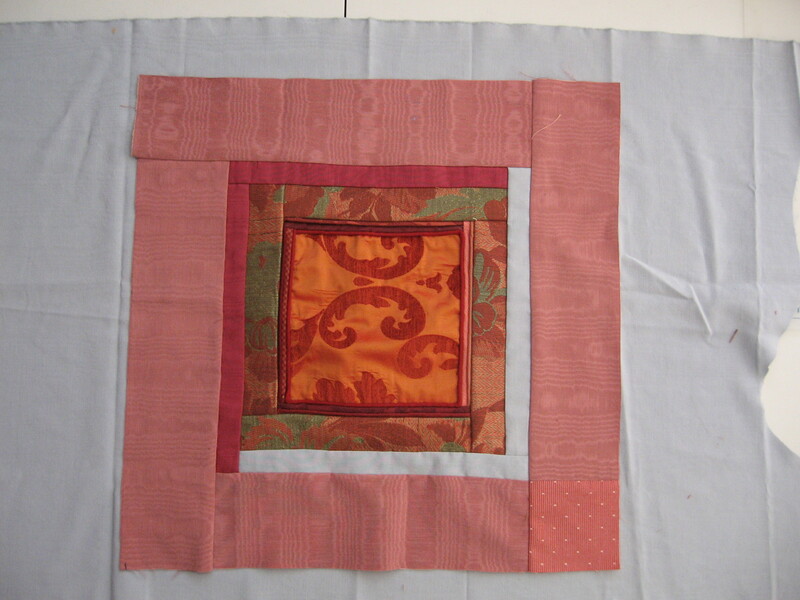 After cutting off the label and getting it cut out of the book, she was left with a nice square piece. 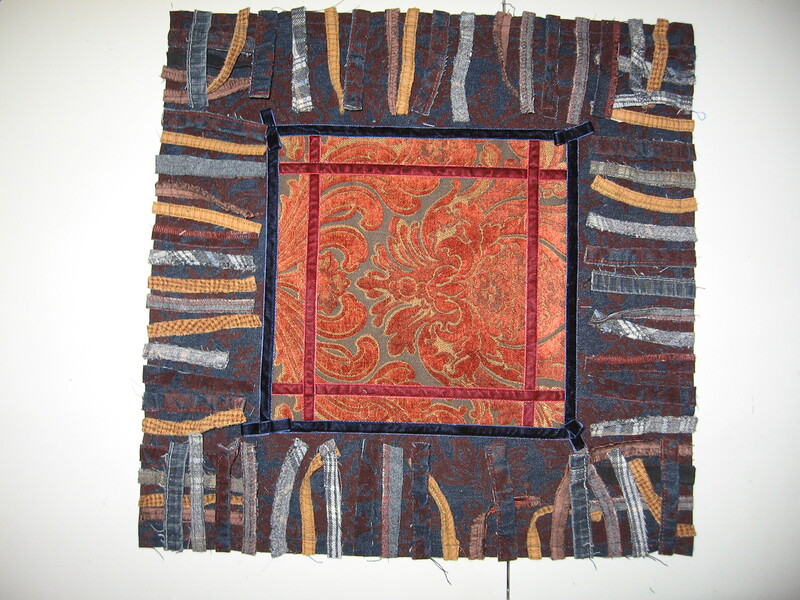 As it is with all of her InSewVation pieces, she just uses her intuition to grab this and that and compile a composition, improvising the construcSewn as she goes. 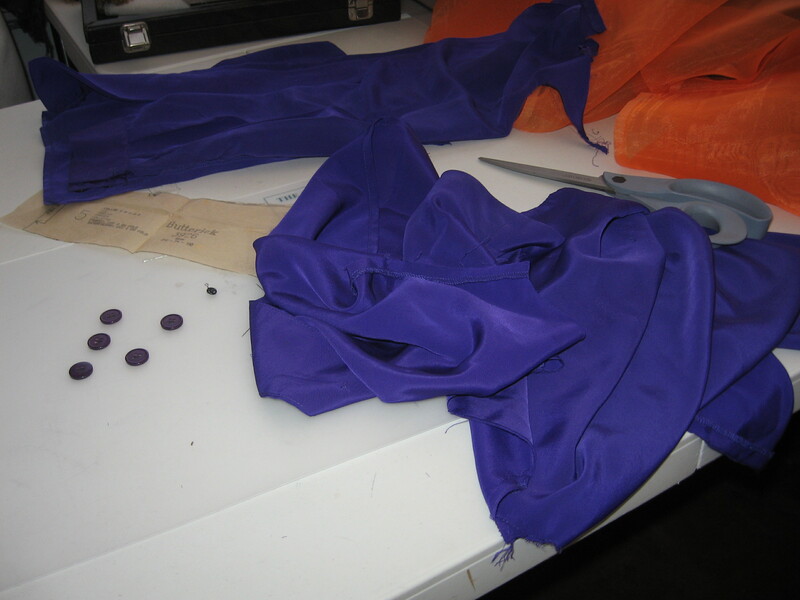 So much for that idea, now what…hmmm! 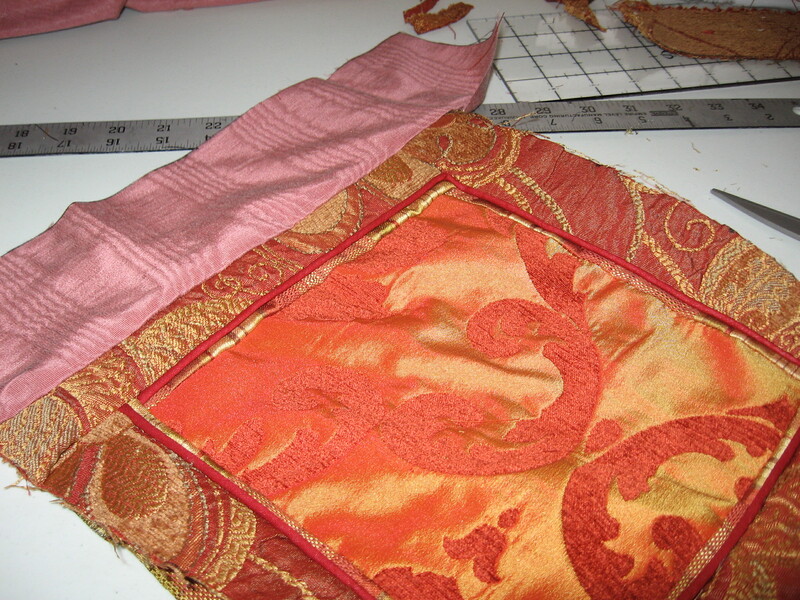 Paisley center, more to be done, on to InSewVation Fabric..
And she thought she had perfectly centered the fabrics, but after fully securing the pieces and piping, they were not! 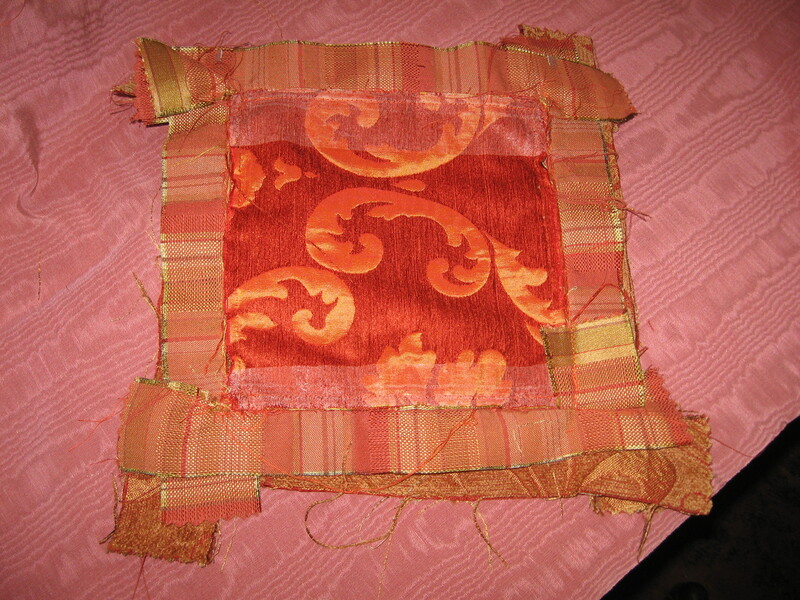 And she was not going to pull it all apart again. 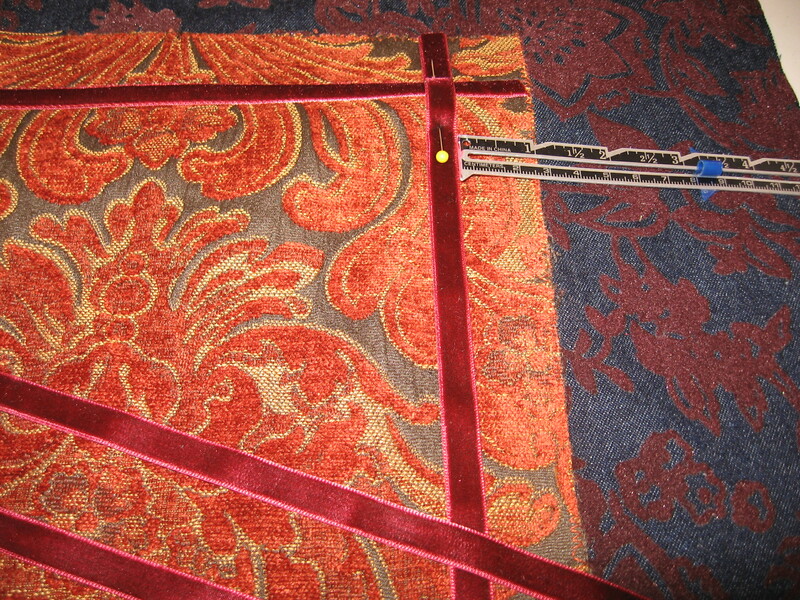 As it turned out, it didn’t matter. 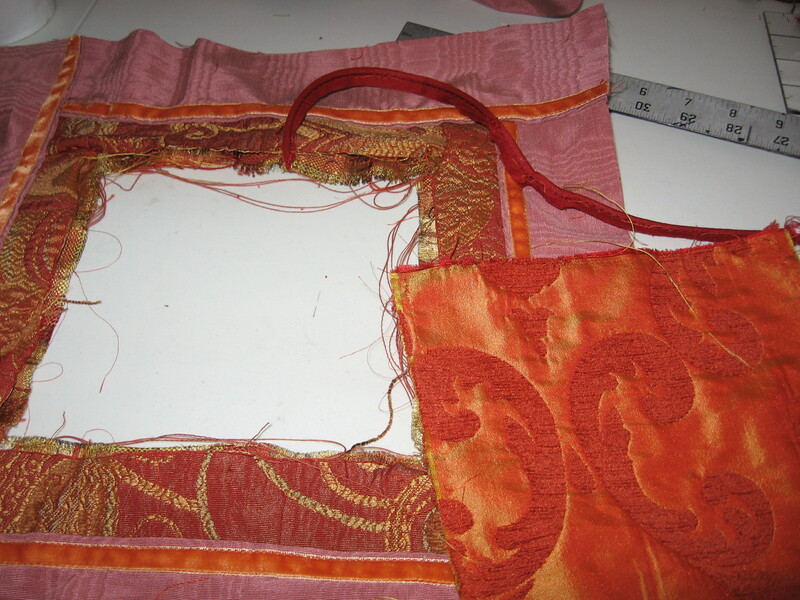 Oops, she got so involved in just doing it, she forgot to take the pictures of it in progress, but now she was happy. 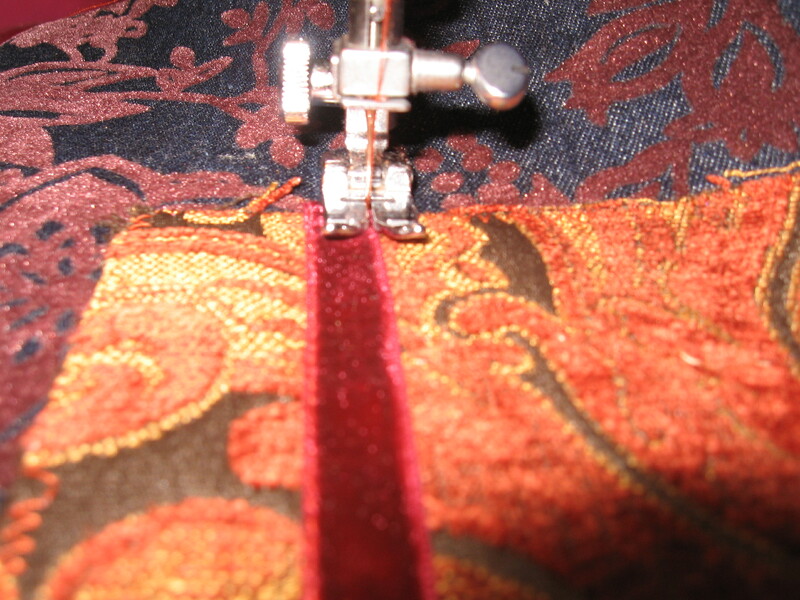 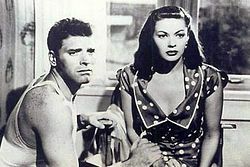 She decides it doesn’t need any velvet embellishment, it stands on it’s own just the way it is. 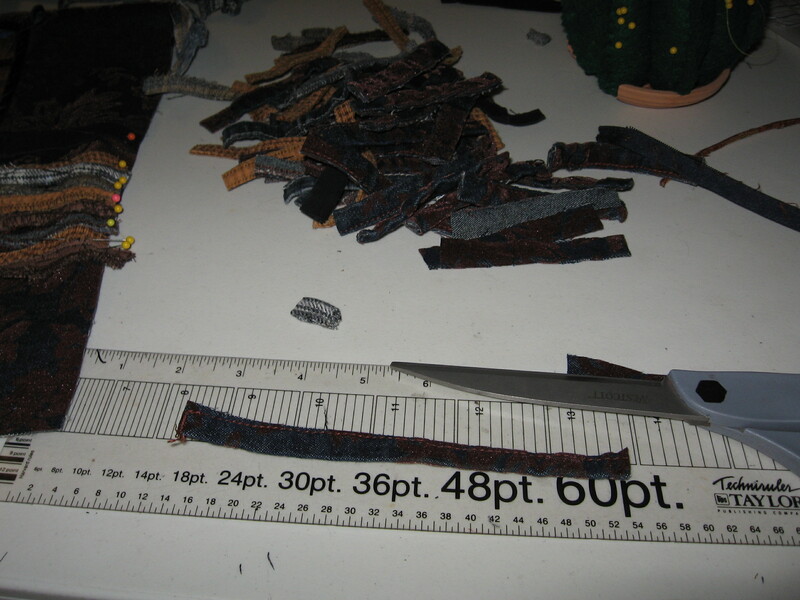 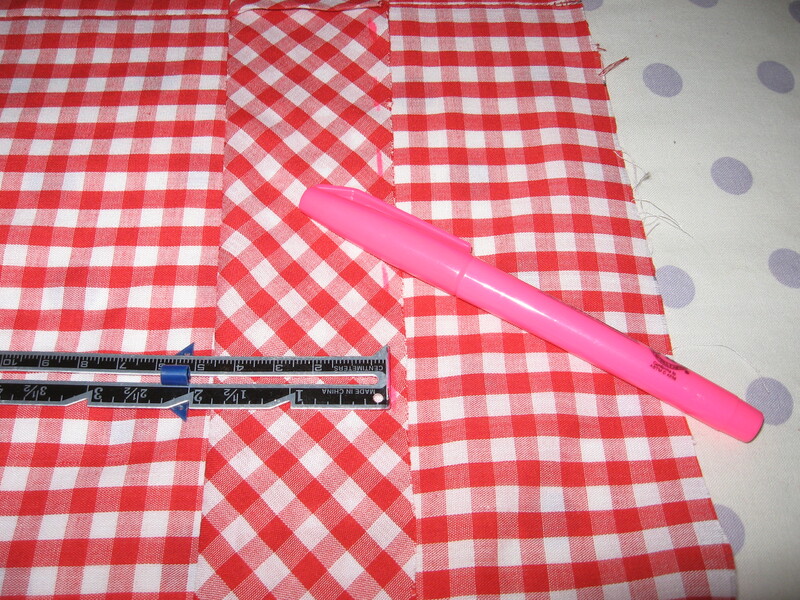 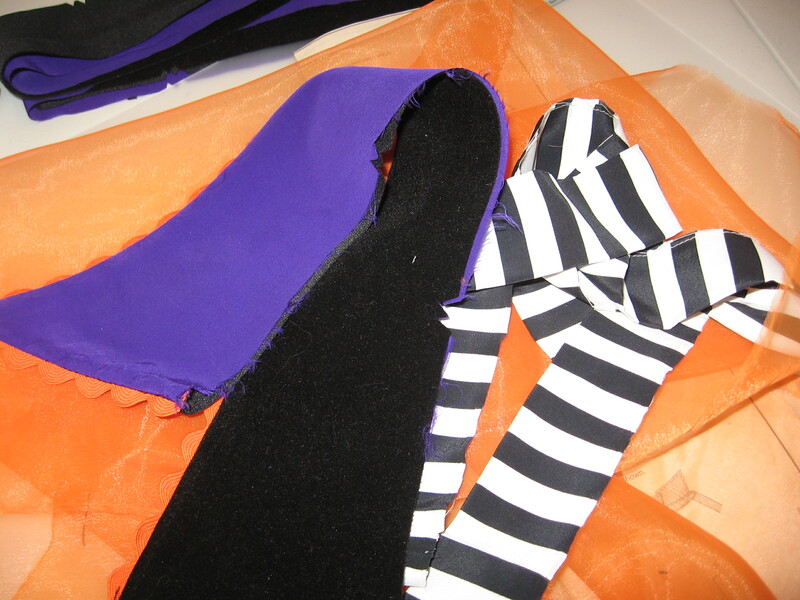 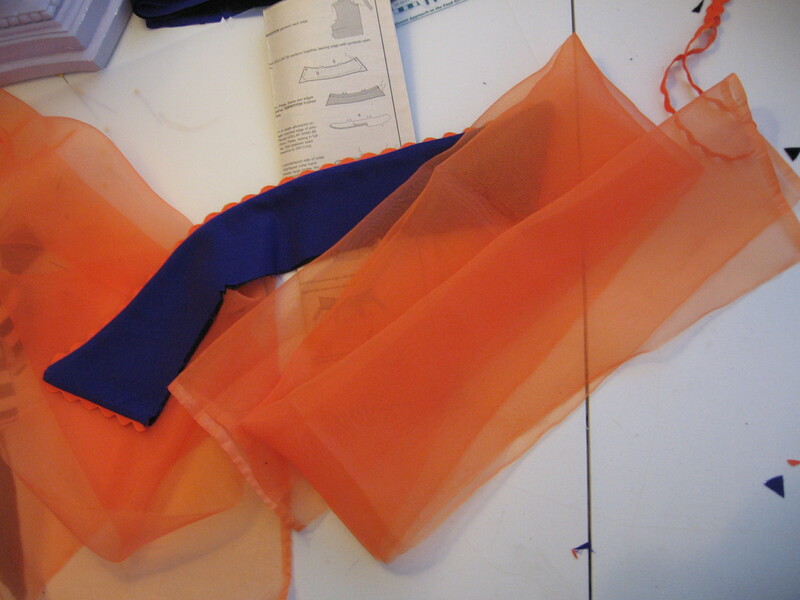 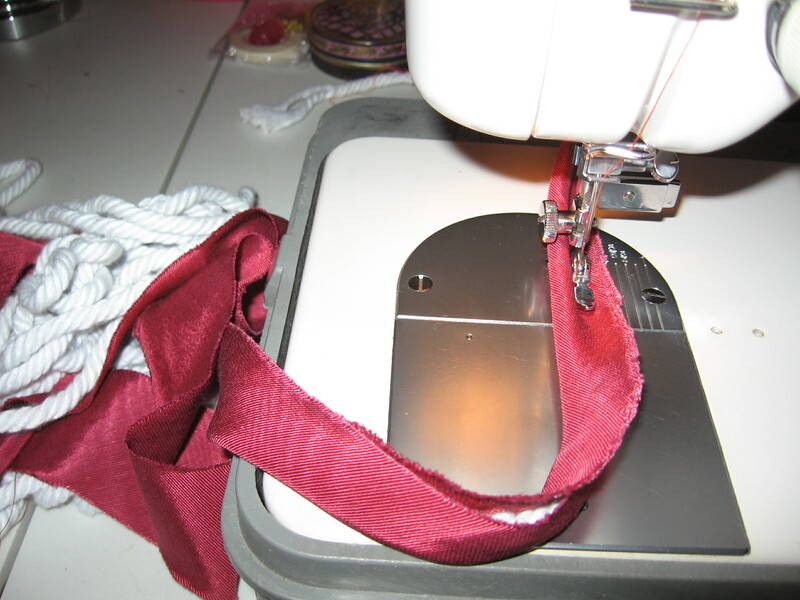 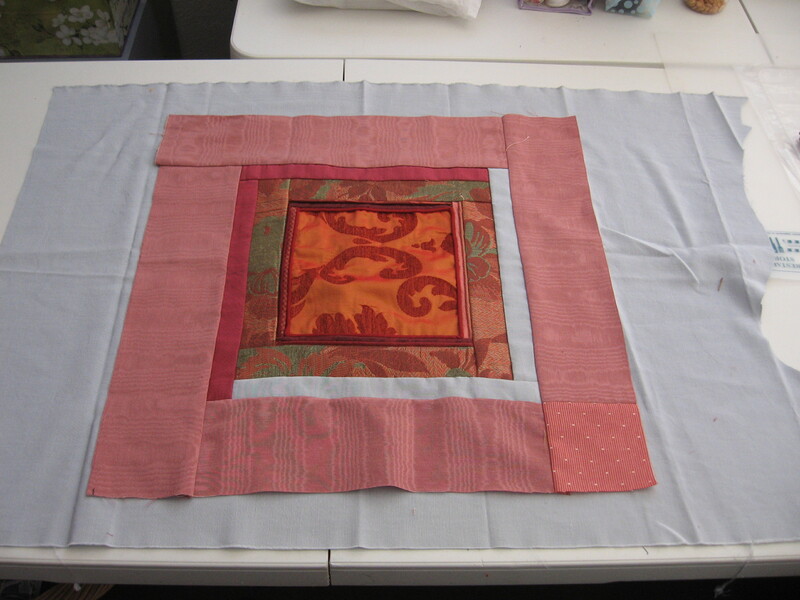 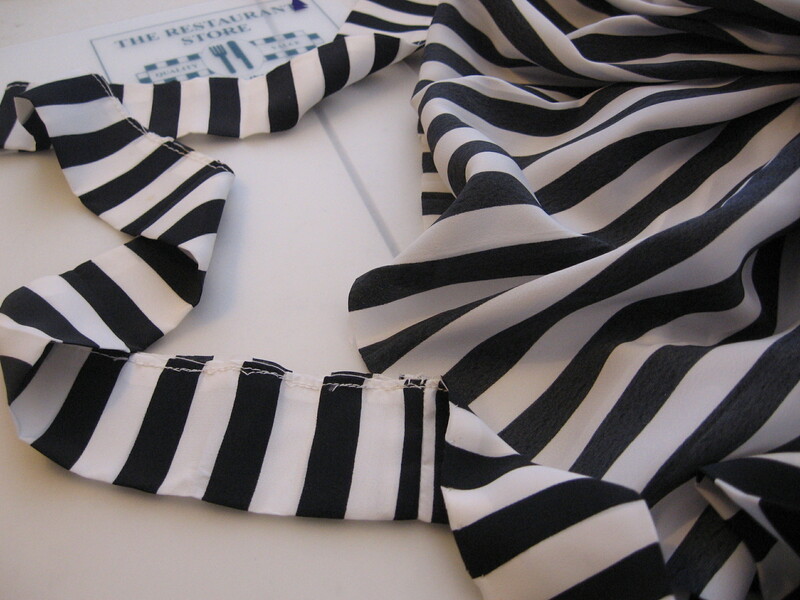 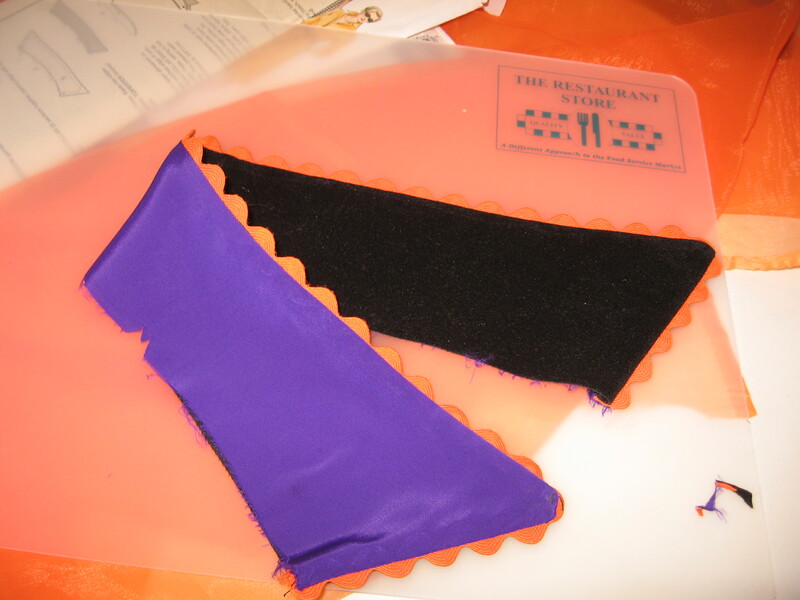 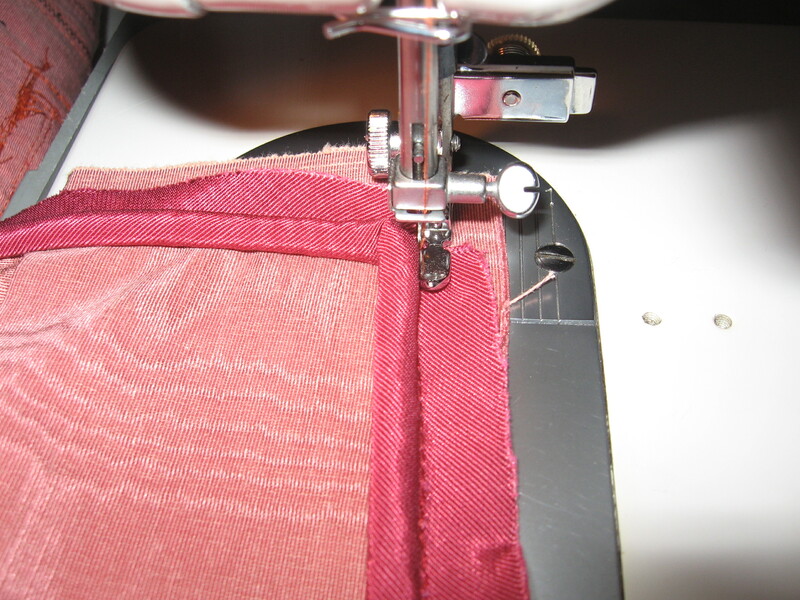 As she was going along adding the final frame, she realized she had clipped the first strip before she realized she would need that corner to lap the forth piece over…she would worry about that when she got there…(so much for “measure twice, cut once”! 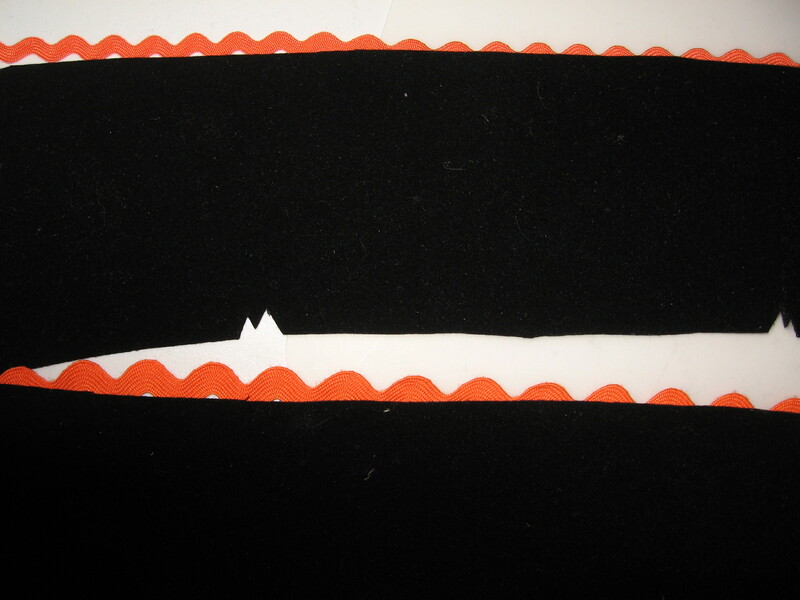 This tends to be a signature of hers, to leave some kind of hint of imperfection, It’s probably subliminal…don’t ya s’pose? 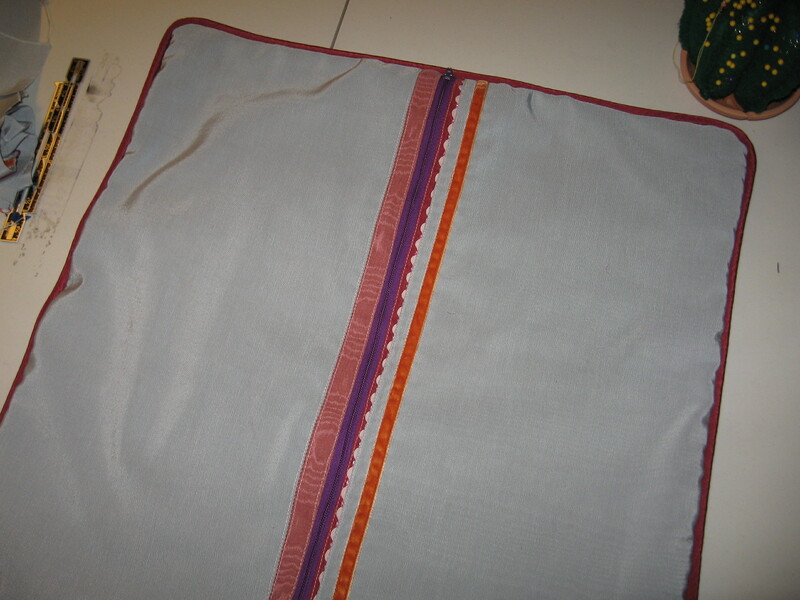 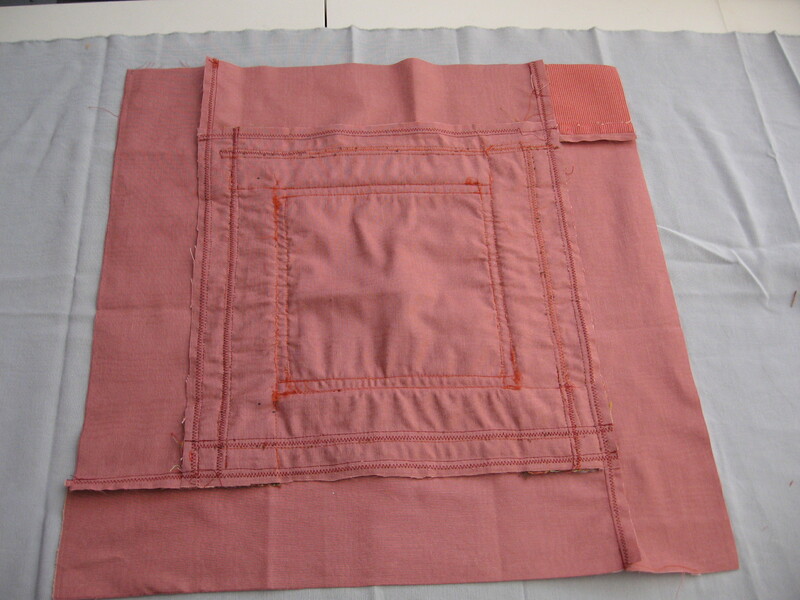 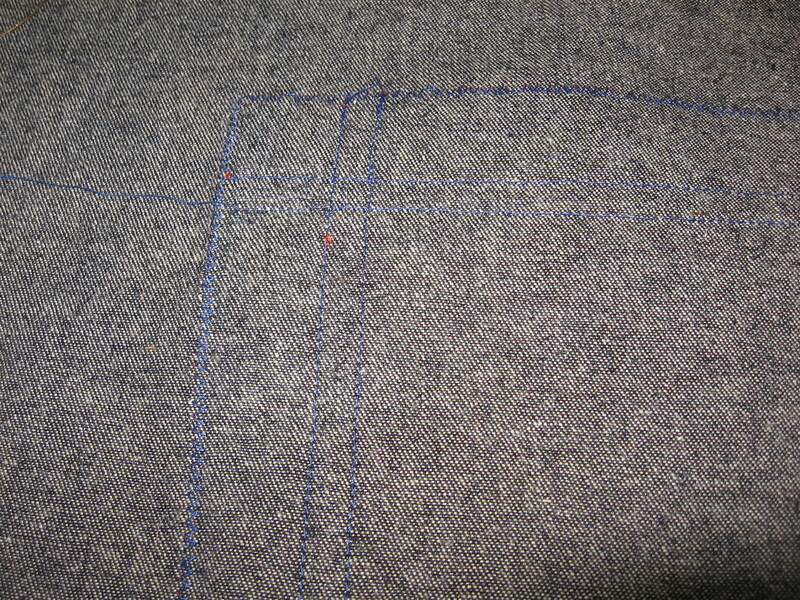 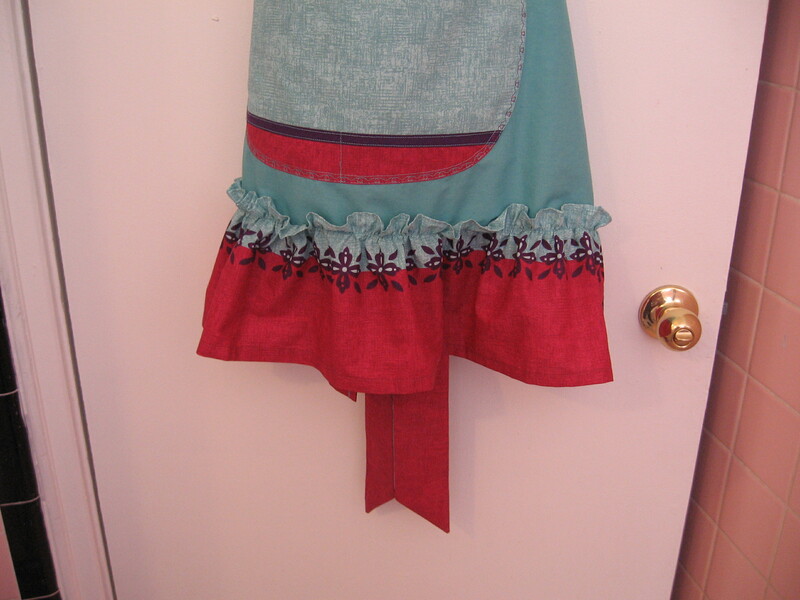 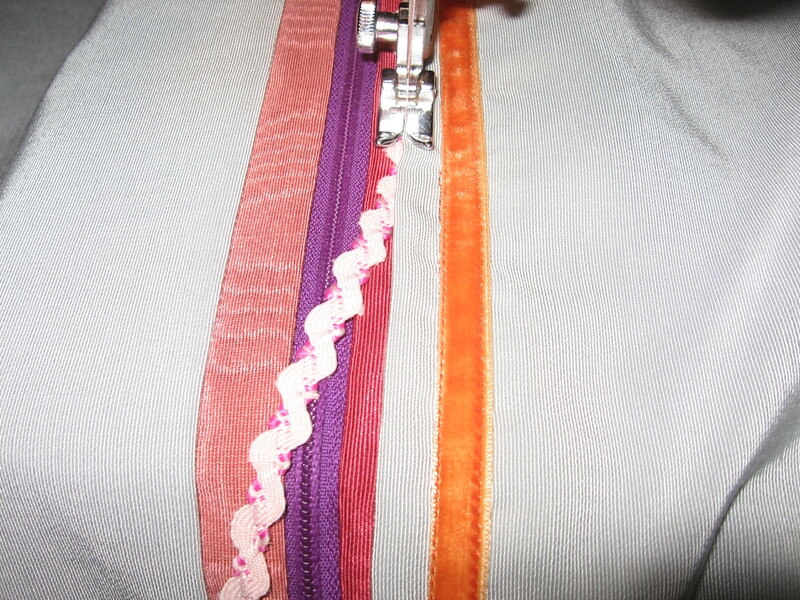 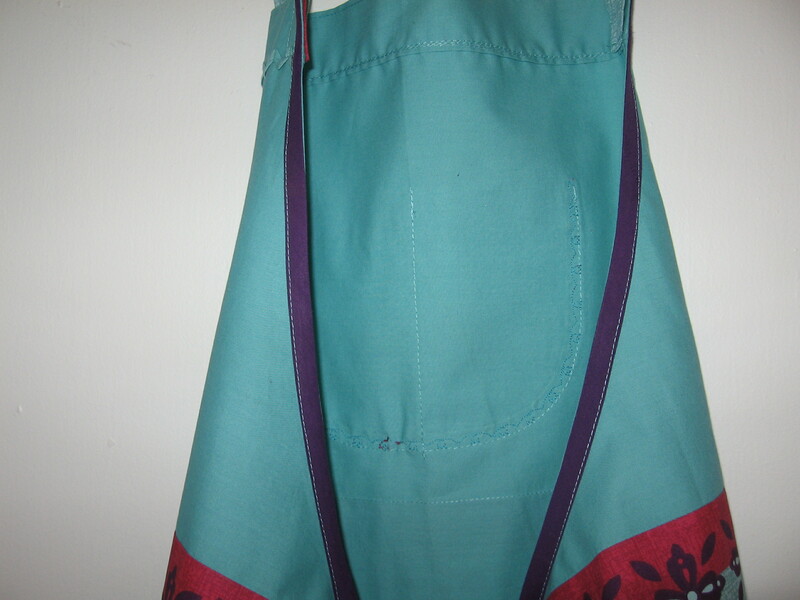 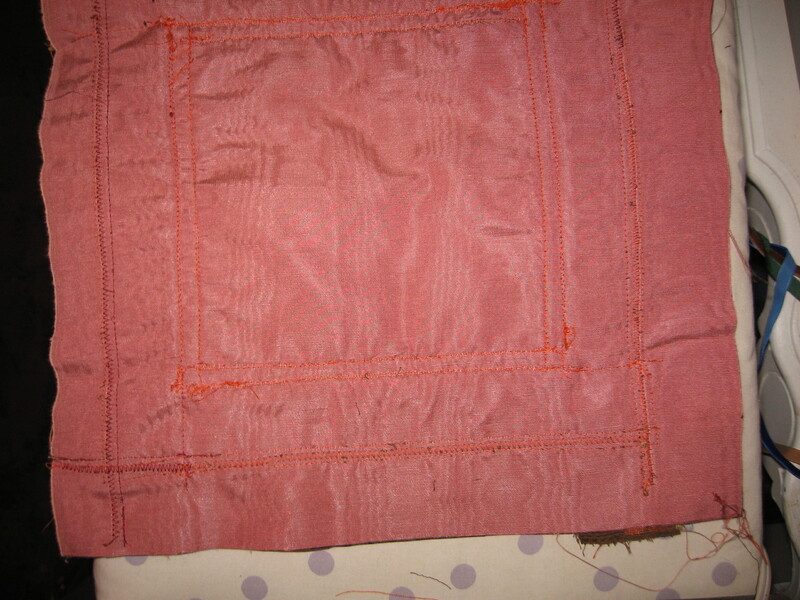 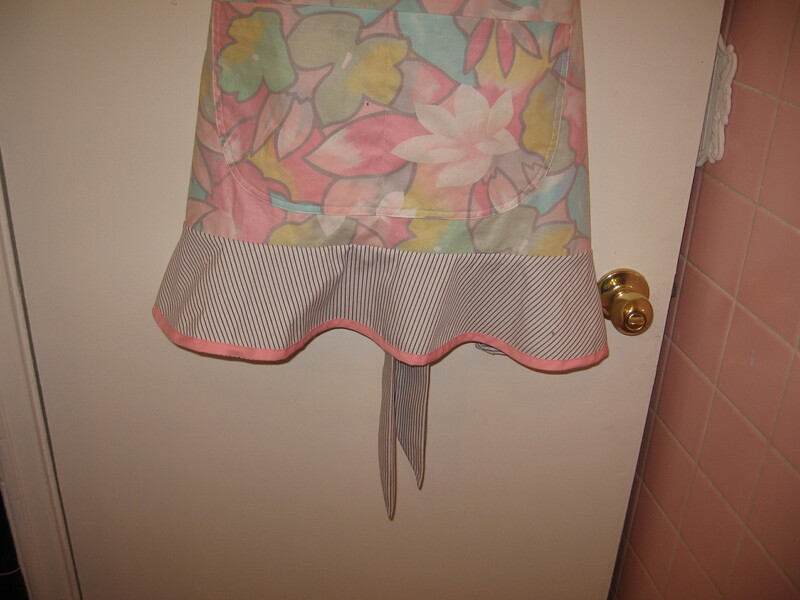 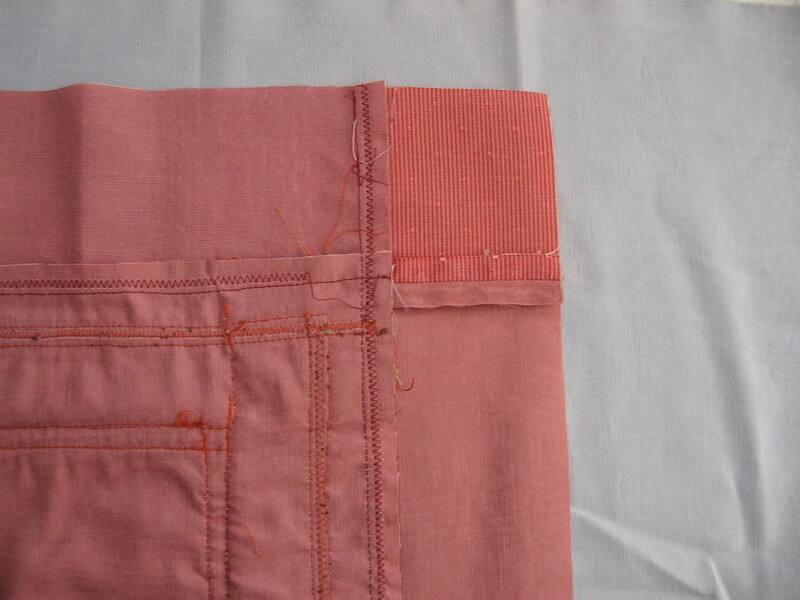 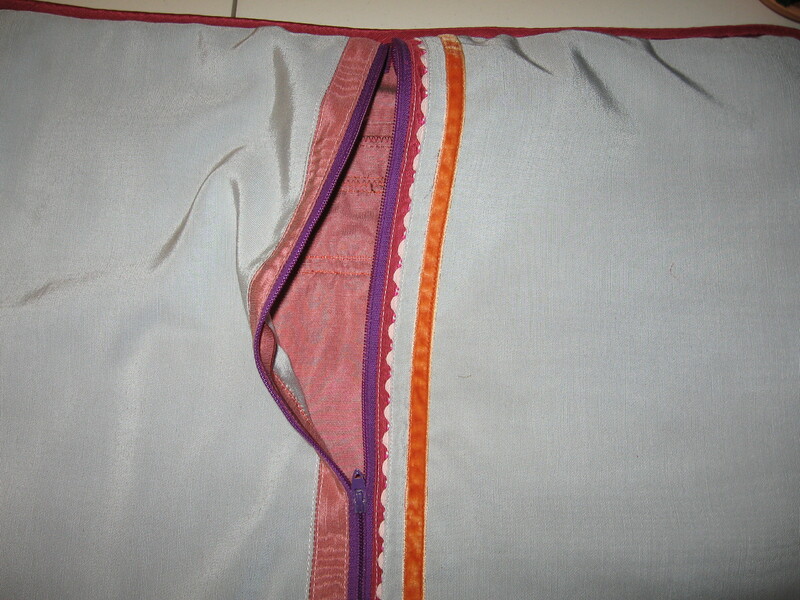 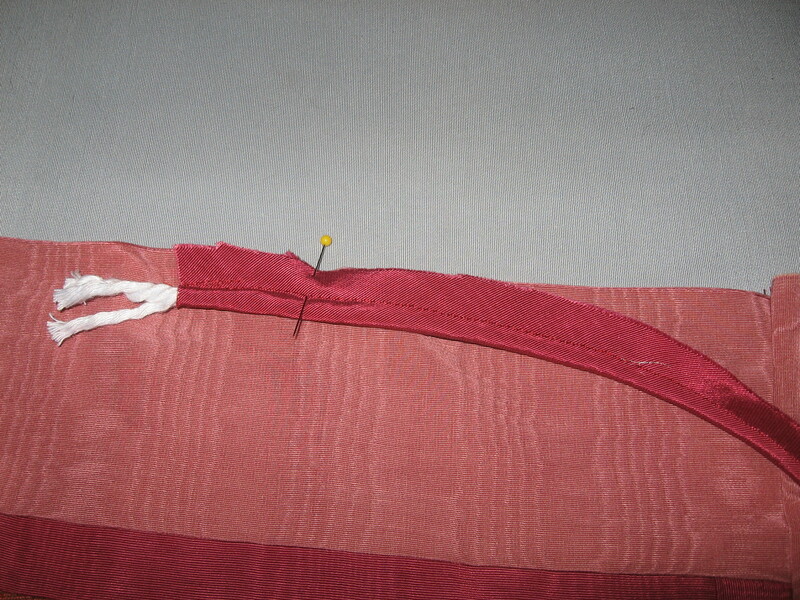 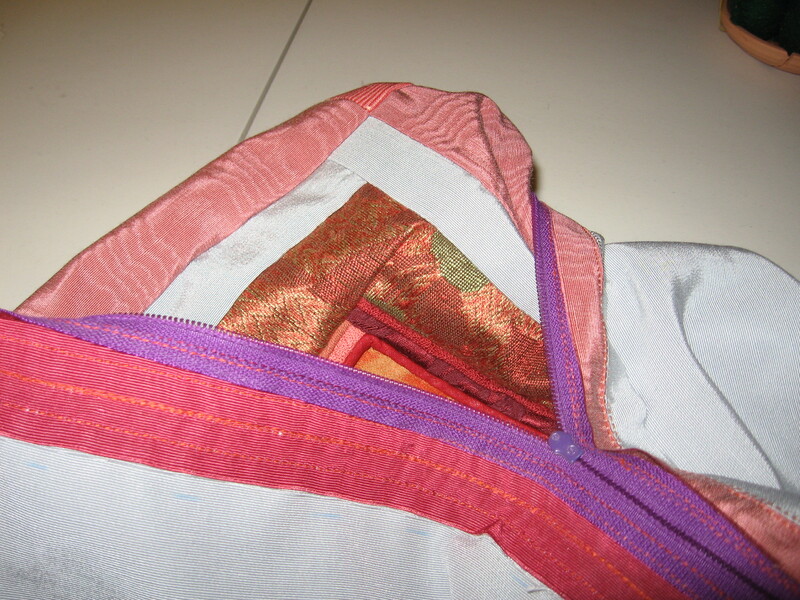 Notice the corner piece spliced in, (she could have just left it the pink moire but then the lap overs would have been wrong, she liked this wrong better anyway).